Click here to move directly to the Finish Styles/Types link bar. 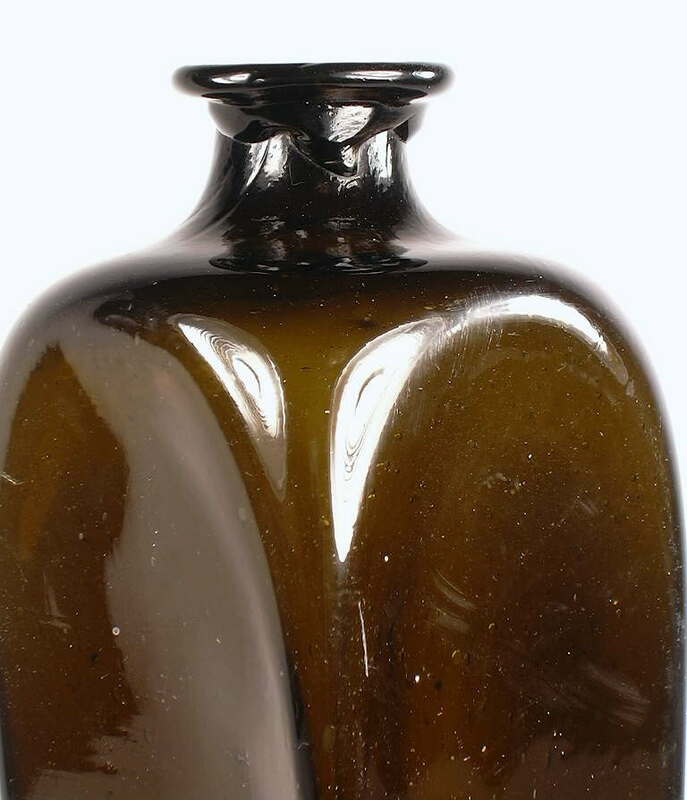 A wide variety of different types of finishes or "lips" were utilized by different glass makers, on different types of bottles, and during different eras. Even within a given finish type or style there are many subtle variations and gradations between different examples. 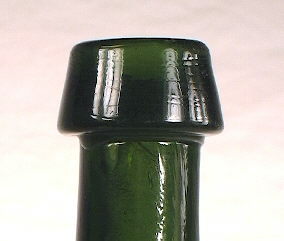 Some finish styles can be indicative of the product that the bottle held. For instance, the finishes in the picture above are all "typical" for the particular bottle type and era of production. 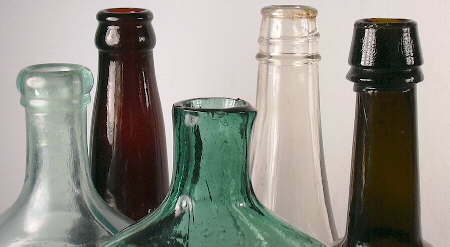 From left to right in the picture are the following finishes/bottle types: double ring finish on a patent medicine bottle (1880s), crown finish on a beer bottle (1910s), straight finish on a figured or pictorial flask (1850s), small mouth external thread finish on a catsup bottle (1920s), and a mineral finish on a liquor or ale bottle (1860s). 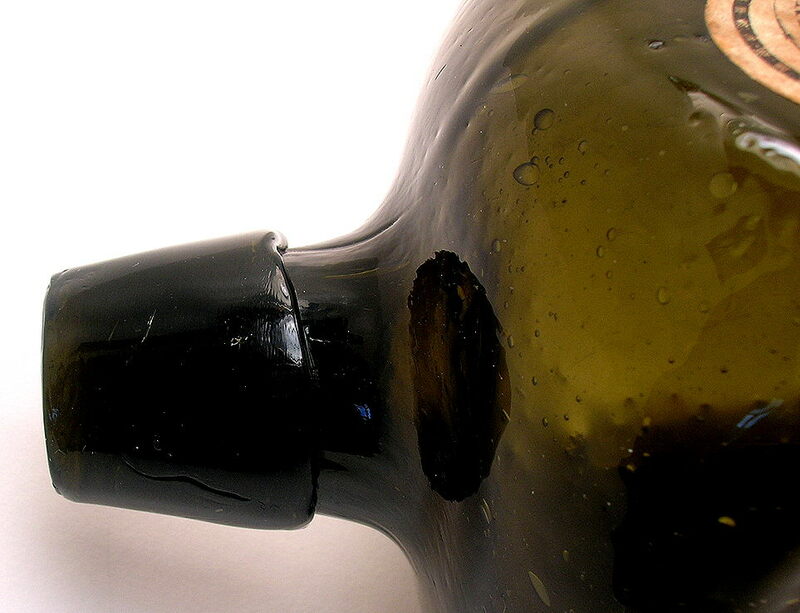 However, like most aspects of historic bottle dating and identification, the realm of bottle finish types is very complicated and difficult to simplify or standardize. There are countless finish variations and crossovers between styles of finish and bottle type or function. 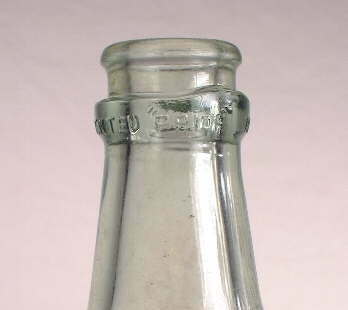 For example, the first finish noted below - #1 Double Ring - has pictured examples of virtually identically shaped finishes on two proprietary medicines (that date 60+ years apart), a pepper sauce (food) bottle, and a liquor flask. 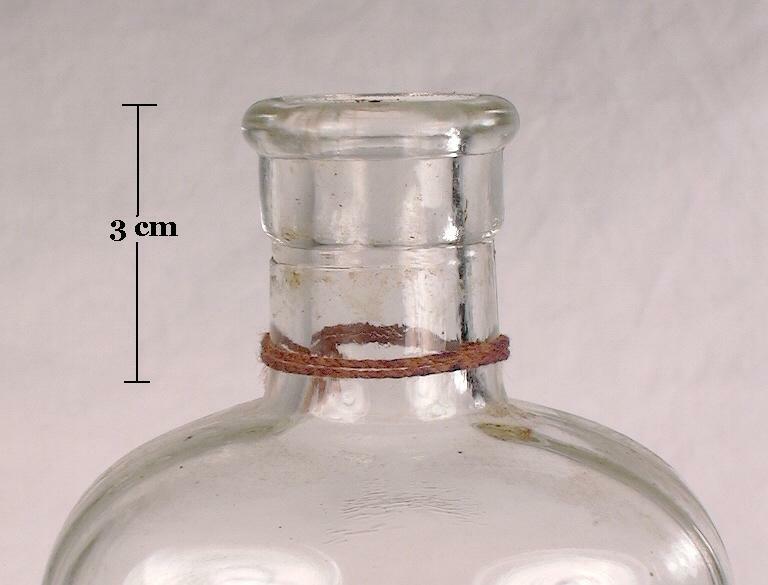 Regardless of this crossover use, there is often some value in the dating and identification of historic bottles based on finish type or style. There is also a lot of confusion and inconsistencies in the terminology used to refer to the same style of finish which points out the utility of establishing some naming standardization for this site. 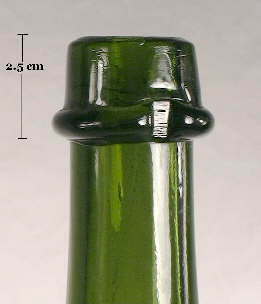 The classification of finishes within this complex of pages is based primarily on morphology, i.e., the shape of the finish, not function (i.e., intended use of the bottle the finish is on) since many of the finishes crossover between several functional groups - like the double ring finish example noted above. However, classification by functional group is a valid alternative and complimentary approach and one that may be added to this website in the future, most likely via the Bottle Typing/Diagnostic Shapes pages. It is hoped that this website can help clarify and standardize the naming of the majority of finish styles, though given the confusion and differences of opinion on the subject, that may not be possible. - Describe the most widely accepted names and the range of known names for each type of finish. - Show examples of the different finish types and variations within each type. - Describe the predominant uses for each finish type, as possible. - Discusses the dating utility of different finish types, as possible. The basic naming nomenclature used on this website originates with the Bottle Neck Finishes illustration on the IMACS - Intermountain Antiquities Computer System - website; a website that used to be hosted and maintained by the University of Utah. Unfortunately, the hosting of that website has been discontinued recently (2015). 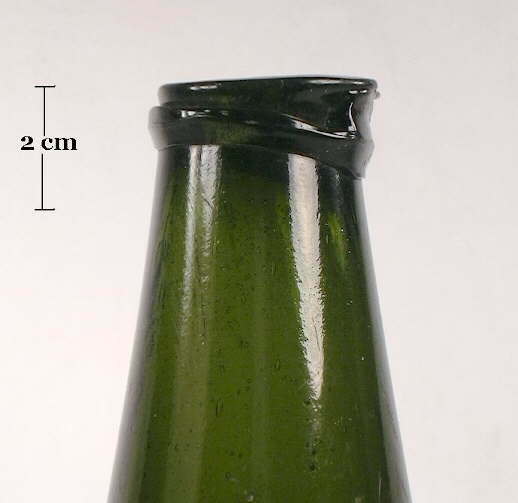 However, a scanned copy of the bottle portion of the IMACS guide can now be found on this website at this link: http://www.sha.org/bottle/pdffiles/IMACSUsersGuide1992.pdf A copy of the IMACS Bottle Neck Finishes illustration by itself can be found at the following link: http://www.sha.org/bottle/pdffiles/IMACSfinishes.pdf The IMACS illustration was taken from Richard Fikes' 1987 excellent book on embossed medicine bottles - "The Bottle Book: A Guide To Historic Medicine Bottles." Much of the information for the Fike/IMACS list was apparently an expansion of the information derived from Berge (1968, 1980) who in turn depended on the information from Freeman (1964) and Putnam (1965). Unfortunately, the IMACS/Fike illustration did not cover every possible finish and some of those listed appear to be somewhat idealized. 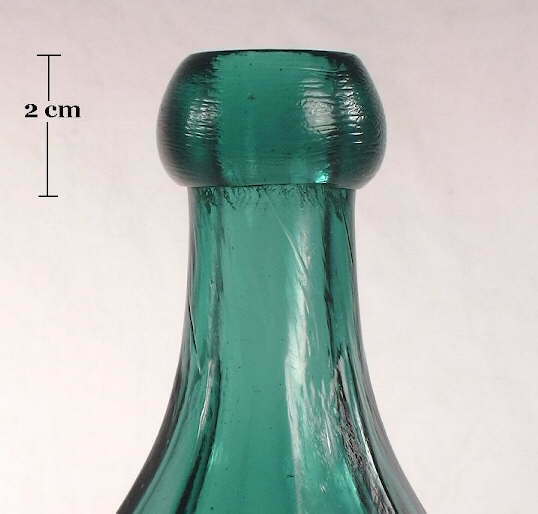 Some of the finishes covered also appear to overlap somewhat with other described finishes (depending on whether you are a "lumper" or a "splitter"), are uncommonly seen on historic bottles, and/or are simply hard to decipher precisely from the illustration. However, many of the most important finishes are shown on the illustration. Fike used the illustration presumably for the purpose of showing the array of medicine bottle finishes possible and the illustration may not have been intended to be all embracing. Additional distinct finish types have been added to this part (Page 3) to expand on the 25 IMACS types (Pages 1 & 2). The IMACS is/was used by the Bureau of Land Management, U.S. Forest Service, and some state governments in the Intermountain West to - as stated in the IMACS guide - "...provide archaeologists with a manual for a standard approach to arriving at historical artifact function and chronology". This website tiers off the IMACS finishes listing because it is a good basic listing and the IMACS is an already accepted resource. Many references were consulted in preparing the three separate webpage's that comprise this portion of the Historic Glass Bottle Identification & Information Website - Part II: Types or Styles of Finishes. Of primary importance were: Whitall Tatum Co. (1879, 1880a, 1892, 1900, 1902, 1909, 1924), W. H. Hamilton Company (1898), Illinois Glass Co. (1899, 1903-04, 1906, 1908, 1911, 1920), Robert J. Alther (1909), Bellaire Bottle Co. (ca. 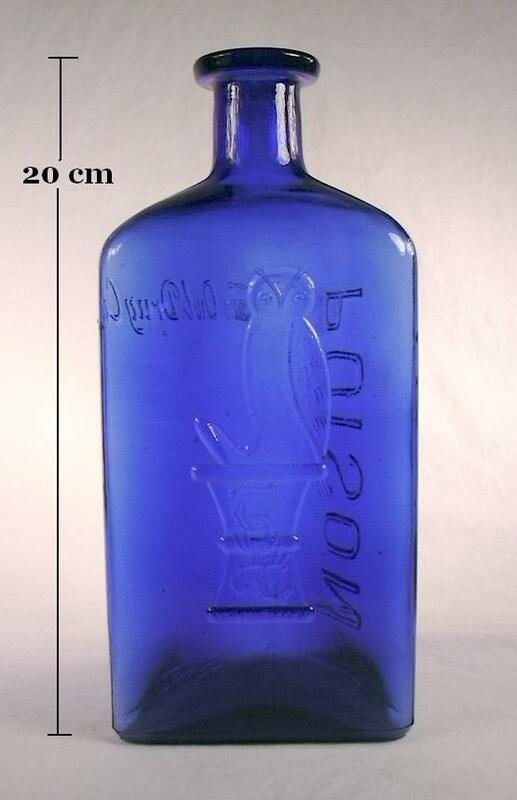 1905-1910), Fairmount Glass Works (1910), Kearns-Gorsuch Bottle Co. (1916), Obear-Nester Glass Co. (1922), Owens Bottle Company (1928), Freeman (1964), Lief (1965), Berge (1968,1980), Agee (1969), Toulouse (1969a & 1969b), Newman (1970), Munsey (1970), Kroll (1976), Herskovitz (1978), White (1978), McKearin & Wilson (1978), Stevens (1979), Berge (1980), Ring (1980), Unitt (1980b), Wilson (1981), Deiss (1981), Firebaugh (1983), Fike (1987), Feldhaus (1987), Jones & Sullivan (1989), Sives (1992), Pollard (1993), Huggins (1997), Wichmann (1999), Leybourne (2001), Graci (2003); von Mechow (2009 - website), Farnsworth & Walthall (2011), and Schulz et al. (2016). Other references were also consulted, but to a lesser degree than those listed, including most of the other glassmakers catalogs noted on the References page. The notation about how may "parts" a finish has - one-part, two-part, or three-part - is taken from Jones & Sullivan's The Parks Canada Glass Glossary (1989) and refers to the visually distinct sections that a given finish may have. If a two-part finish, the lip is also frequently referred to as the upper part and the collar as the lower part. If a three-part finish, the middle part is referred to as that - the middle part. 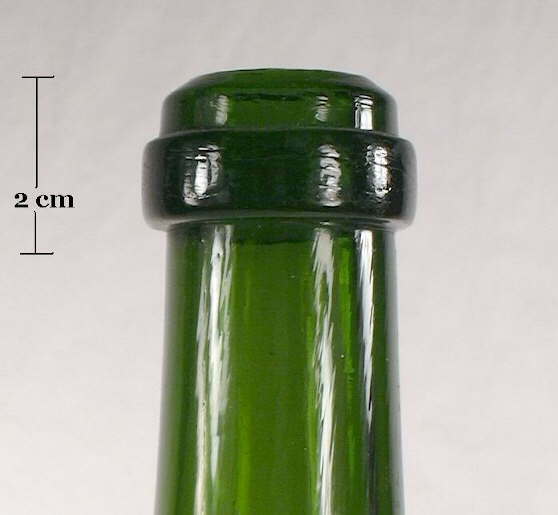 Be aware that all of the "parts" were almost always manufactured together, not separately as the parts notation may seem to imply (see Part I: Methods of Finishing a Bottle). 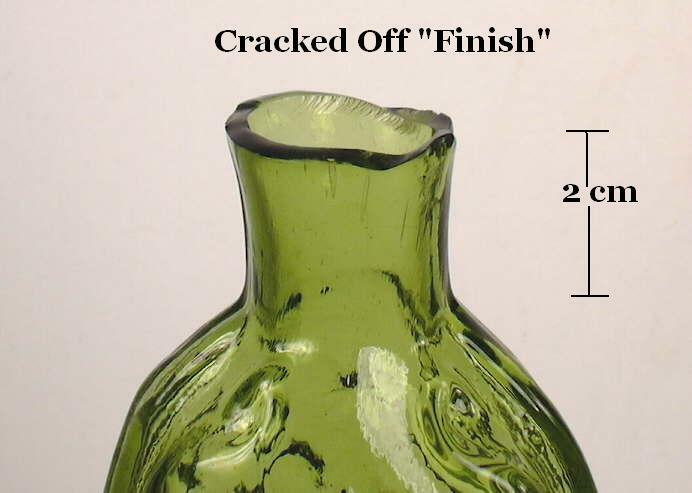 The finish use and dating information noted for each finish type is based on a synthesis of published materials and the empirical observations of this site's author over many years of studying historic bottles. References are noted where possible, though only limited information has been published on the subject of finish types and their dating and use. A listing of each finish type covered in Part II - which is comprised of this page and two other linked pages - is found in the table below with representative thumbnail pictures. Click on the thumbnail picture in the table to view a larger version of the same picture for closer inspection. If unsure of what finish type a bottle has, scroll down through the pages to view more pictures and variations of each finish type covered. 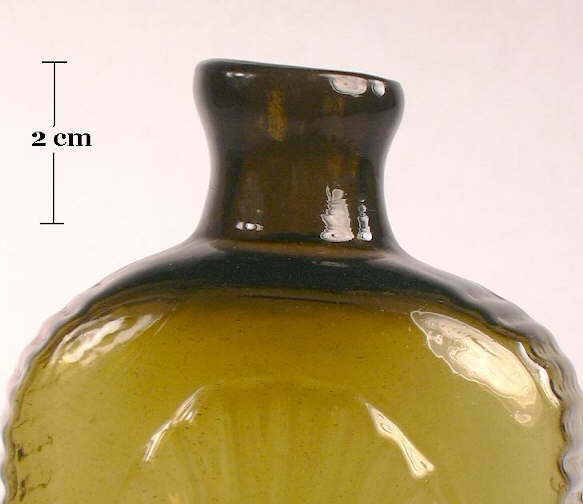 Each finish description narrative also contain hyperlinks to images of the entire bottle(s) that the given finish is found on. As noted earlier, the IMACS 25 list has been expanded to cover an assortment of other distinct finishes; these begin with finish #26. 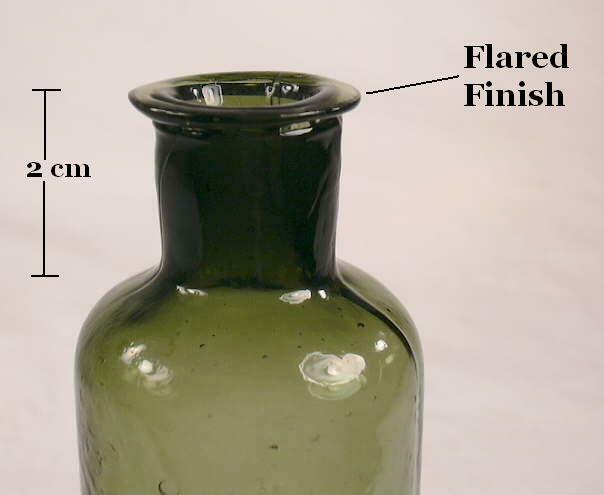 In the finish specific narratives each finish type is briefly described, the known alternative names noted, the types of bottles that finish is primarily found on also noted, and one or more images listed to show the typical as well as some variations of the finish on different types of bottles. 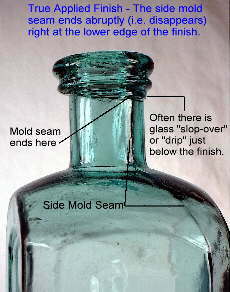 See the General Bottle Morphology page for more details on finish related terminology. This two-part finish is composed of two connected "rings" - a thicker (taller) and slightly wider (side to side) variably rounded ring at the top of the finish (the "lip") with a thinner and narrower variably rounded to flat ring below (i.e., "collar"). The upper (lip) and/or lower part (collar) on this finish can sometimes be more of a pointed "ridge" with flattened surfaces leading up the "peak" of the ridge. When the upper part is rounded and the lower collar has a sharper outer edge this has been called an inverted double ring (Feldhaus 1987), ring with skirt (Blasi 1992), or broad round collar with lower bevel (McKearin & Wilson 1978). An example of this is the cobalt blue bottle to the lower right. 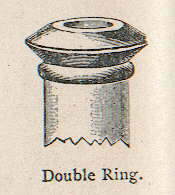 The illustration to the above right is from the 1908 Illinois Glass Company catalog and shows that company's double ring finish which has a sharp outer edge to the upper part and a rounded lower part. This was also called a citrate of magnesia finish as this variation is very often found on such bottles (Alther 1909; Bellaire ca. 1905-1910; Berge 1980). Other variations can have either or both rings somewhat or totally flattened on outside. For the purposes of this website these minor variations are all considered to be double ring finishes. The stacked ring finish (finish #23) which consists of two equally proportioned rings is also considered as a variation of the double ring finish. 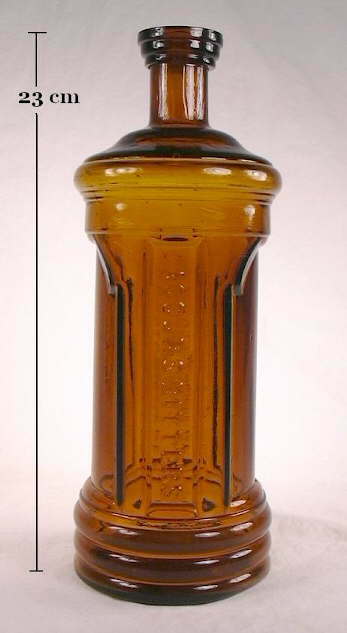 This popular finish was used on many different bottle types but was most common on wide array of patent/proprietary medicines, many varieties of liquor flasks, various sauce or narrow necked food bottles, figured or pictorial flasks, and occasional ink bottles. Between about 1840 and the 1920s, and particularly between 1850 and 1910, this style of finish was one of the most popular and functional finishes used. It can be found on both mouth-blown and machine-made bottles, though is uncommon on the latter. 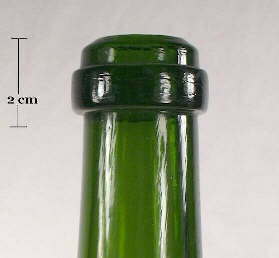 This finish is rarely found on soda, mineral water, or wine/champagne bottles; it is virtually never found on wide mouth bottles or fruit jars. The popularity of this finish was probably a combination of corking strength, relative ease of manufacturing, and probably even esthetics. 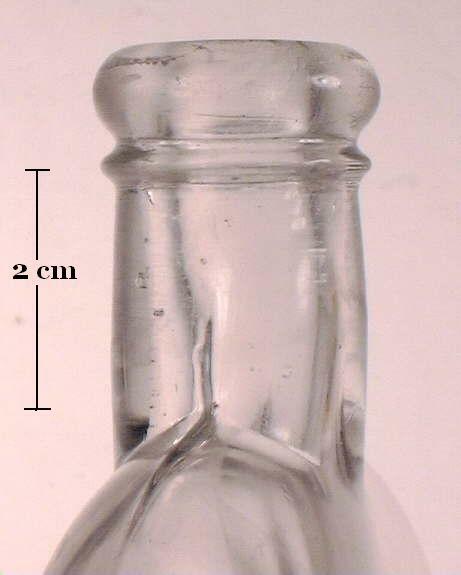 The example pictured to the above left is on a generic (non-product embossed) "cathedral" peppersauce or condiment bottle dating between about 1855 and 1865, as the base has a diagnostic iron pontil scar. The tooled double ring finish to the immediate right (colorless bottle) is on a "picnic" style flask from G. Arata & Co. (Portland, OR.) that dates between 1894-1906. 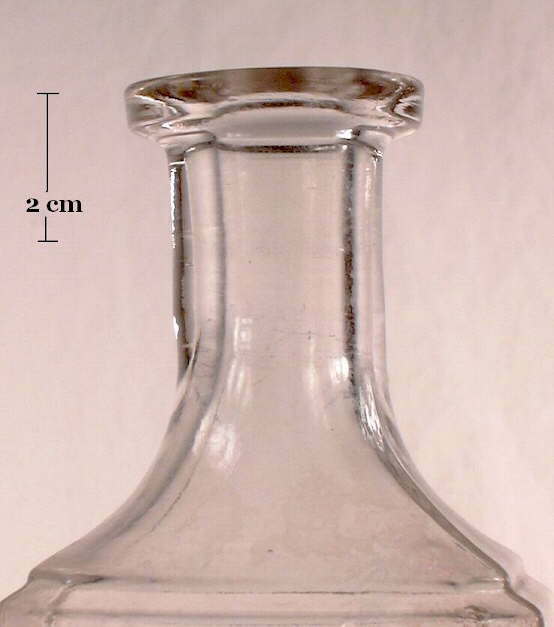 This style of flask typically (but not exclusively) had this type of finish and was most popular between about 1890 and 1915 (Thomas 1998). 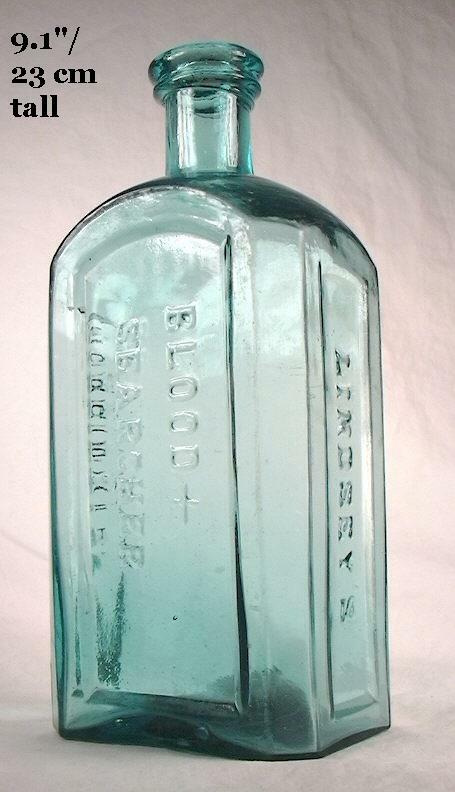 The applied double ring finish to the middle right (blue green bottle) is on a large proprietary medicine bottle - Lindsey's Blood Searcher (Hollidaysburg, PA.). 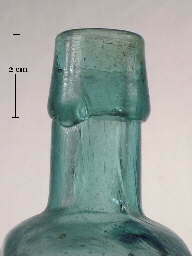 This bottle likely dates between 1855 and 1865 as it has an iron pontil scar on the base. Note the crude finish appearance including the "slop-over" of glass onto the neck from the lower portion of the finish - a key diagnostic feature of an applied finish. 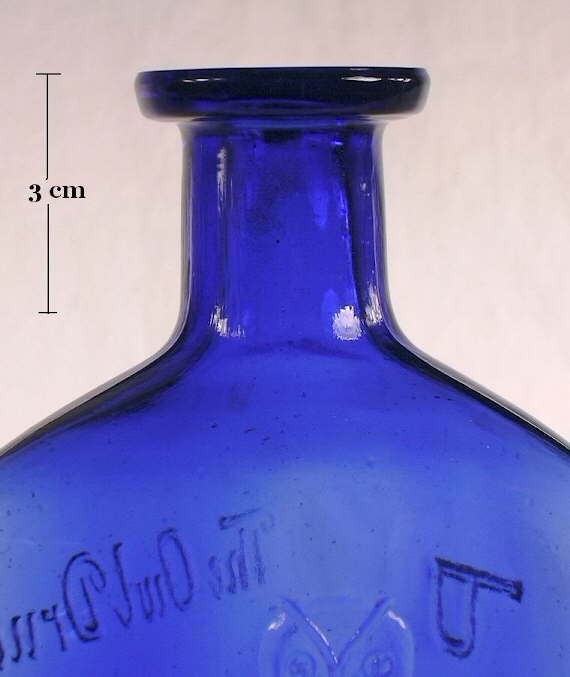 The double ring finish pictured to the far right above (cobalt blue bottle) is on a machine-made proprietary medicinal bottle - Frog Pond Chill & Fever Tonic (Augusta, GA.) which was likely manufactured between 1910 and 1920. 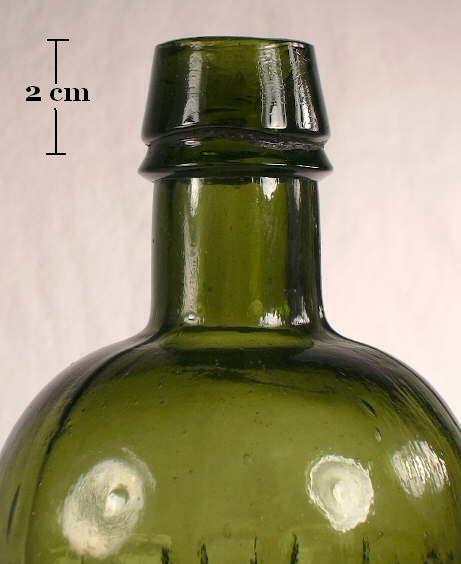 The base has a distinct suction scar denoting its Owens Automatic Bottle Machine heritage and dating no earlier than 1905 (Miller & McNichol 2002). One can see from the assortment of double ring finishes shown here, that the use of this very popular finish type spanned at least 60-70 years. 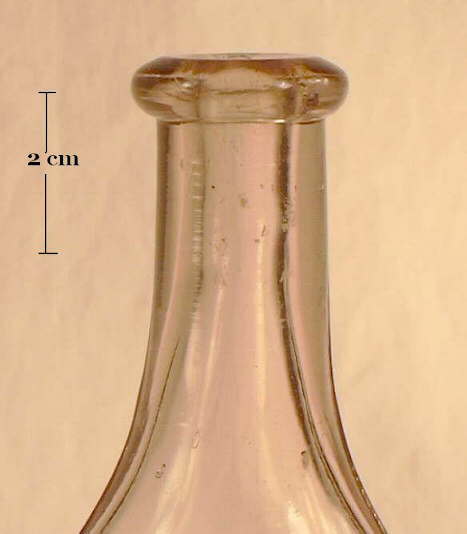 Given this wide span of usage the dating of bottles with this finish must be done using other diagnostic features, including the method of finishing not the type of finish. Click here to return back to the Finish Types Link Bar. 2. 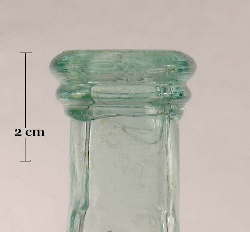 MINERAL or Double Oil - Also known as a double long tapered collar, tapered collar with ring, ring-neck tapered collar, long tapered collar with ring, short brandy with ring, tapered double collar, double tapered collar, tapered with skirt, collared blob, export (if on a beer bottle; aqua finish pictured below right), "Saratoga" (on a "Saratoga" type mineral water bottle; green finish pictured to the left), whiskey finish, sometimes a brandy finish (#12), and simply a double collar. There are undoubtedly other names also used for subtle variations of the mineral finish of which there were many. Click http://www.sha.org/bottle/pdffiles/IMACSfinishes.pdf to see the illustration (#2) in the IMACS table. This two-part finish is composed of a moderately tall, flat sided to slightly rounded and tapered (expanding outwards from rim to base) upper part above a narrow lower part which typically has a more distinct outward flare as shown in the pictures to the left and below. As the images in this section show, the upper part can range from a very distinct taper (image to left) to a more subtle taper (image below right). An alternative description of the typical mineral finish would be to describe the upper part as a down-tooled or sloped top with a V-shaped collar underneath (Jones & Sullivan 1989). This finish is similar to the brandy finish (#12) described later. Frequent gradation between the mineral and brandy finishes make differentiation difficult or impossible at times. 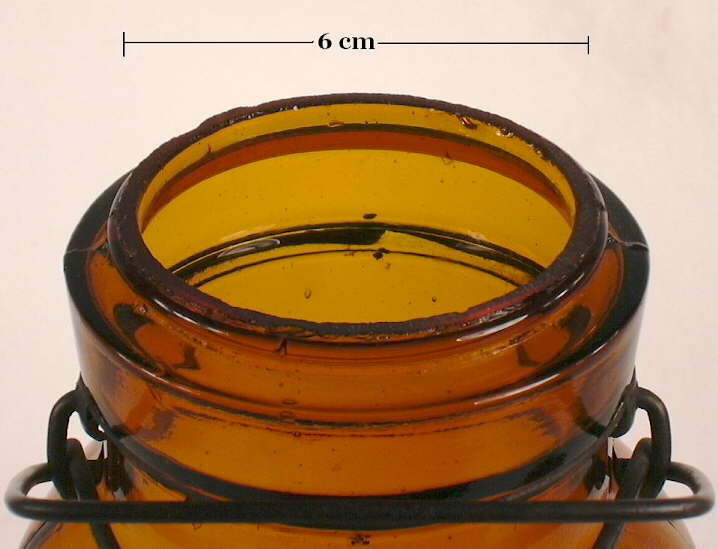 The primary differences are that the mineral finish has a shorter upper part (typically 2-3 times the height of the lower part) than the brandy finish (3 or more times the height of the lower part) and the brandy finish always has a rounded edge to the lower part, i.e., the lower part looks like a narrow, rounded glass "wedding band" sitting below the long tapered upper part or lip. The lower part of a mineral finish has a flattened and flared outer surface which usually comes to a distinct sharp edge as shown in the image above; a feature particularly common on the older (1870s and before) examples. 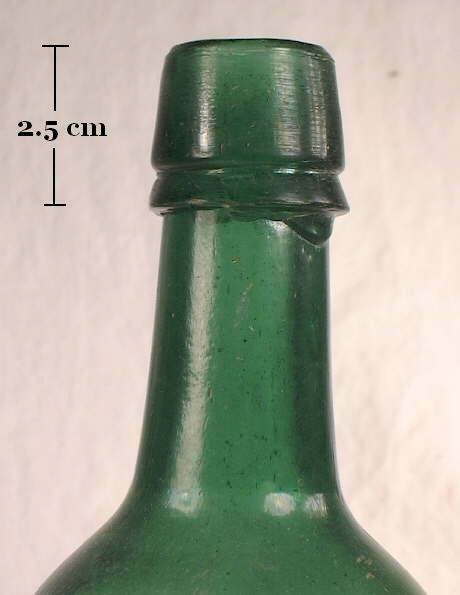 The lower part can be rounded on some of the later (1878 to about 1890) export finish types on beer bottles like shown by the image below of an aqua export beer bottle finish from around 1880 (Lockhart et al. 2006c). These differences are easier see by comparing pictures than it is to describe (click brandy finish for a pop-up image of such). 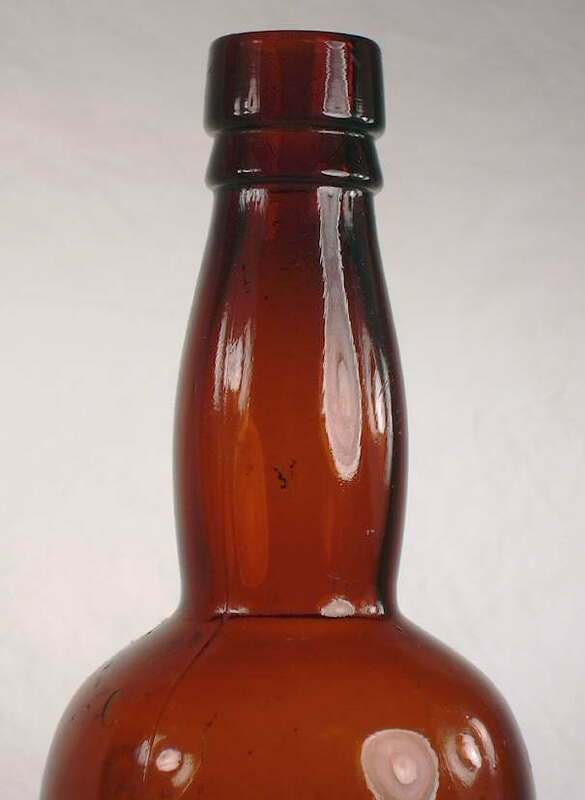 This popular general two-part finish style had a lot of form variation (e.g., taller/shorter upper parts, wider/narrower overall conformation, rounded/sharp lower parts) and was used on a wide assortment of different types of bottles. This finish style appears to have originated in the 1820s with its most frequent use made during the era from the 1840s into the 1880s. It should also be noted that this finish "evolved" over the first part of this period (1820s to 1860s) from a shorter upper part to a distinctly taller upper part (Boow 1991). This is portrayed by the three sequentially pictured examples below right where the oldest bottle/finish is to the far right and the "newest" to the far left. Based on a review of bottle maker catalogs and empirical observations, this finish is uncommon after the late 1880s except on some liquor bottles where this finish type was used well into the 20th century, including on some single malt scotch bottles today. (Click early 1900s brandy bottle finish to view a ca. 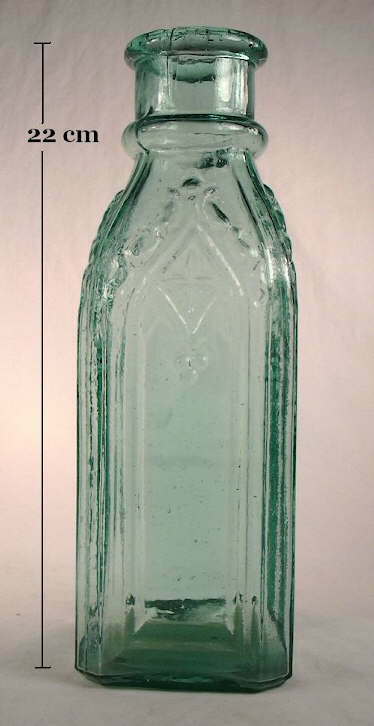 1900 to 1915 brandy bottle from California that has a later type tooled mineral finish which at that time was also called the "whiskey finish' [Fairmount Glass Works 1910].) It should also be noted that mineral/export finishes appear to have been used on mouth-blown Canadian (and English) beer bottles until the early 1900s though largely disappeared on U. S. made beer bottles by around 1890 or so (Lockhart pers. comm. 2007). 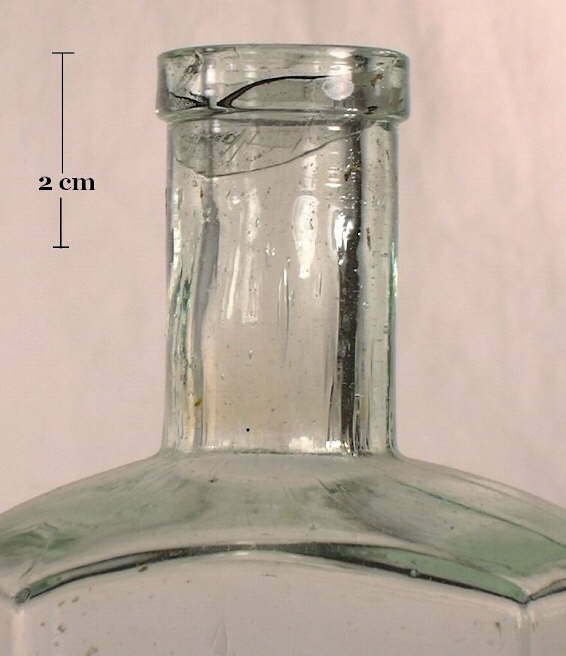 The mineral finish style was very commonly utilized on mid-19th century mineral water bottles - the apparent heritage of the name. 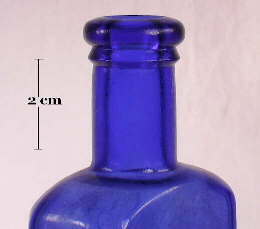 A mineral finish on an actual mineral water bottle is pictured to the above left. Click Congress Water for a picture of an entire "Saratoga" style mineral water bottle which was manufactured around 1875-1885. 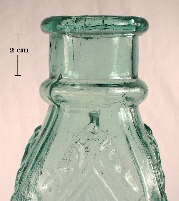 (Click Saratoga style mineral water bottles for more information on this style.) This finish style was also used on earlier soda, mineral water, and ale/porter bottles (1840s to 1870s), some earlier patent or proprietary medicine bottles (1840s to 1870s), wine and liquor bottles of the same era, and occasionally other types like early utility and bulk ink bottles. The three pictures below show some of the variability found on the upper part of this finish - from the later "tall" upper part variety (left picture) to an earlier "squatty" upper part style (right picture). These bottles are described below. The applied mineral finish in the middle image above (olive green bottle) is on an early proprietary medicine bottle - Swaim's Panacea (Philadelphia, PA.). This particular example dates from the late 1850s to mid 1860s. 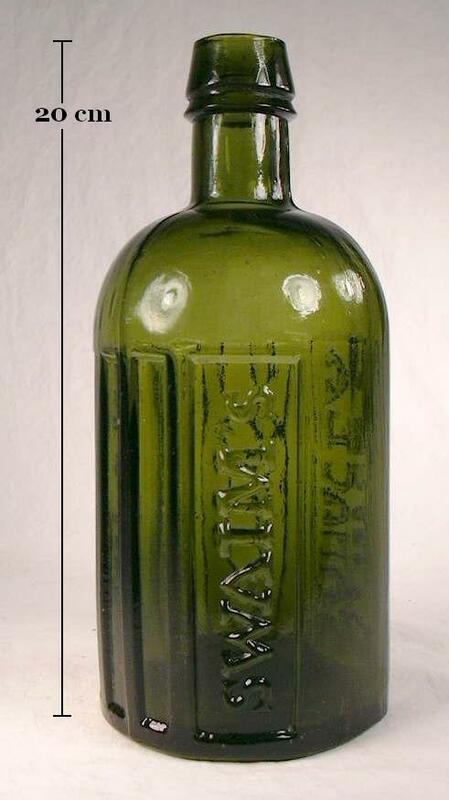 The Swaim's bottles in olive green color were manufactured between 1828 and the 1860s and are among the earliest American proprietary medicines (Wilson 1971). This style finish is most common on medicinals which pre-date the late 1870s. After this period the double ring finish (#1), oil finish (#11), and other styles dominated. The applied mineral finish to the far right above (amber bottle) is on what is often termed a "utility" bottle by collectors. 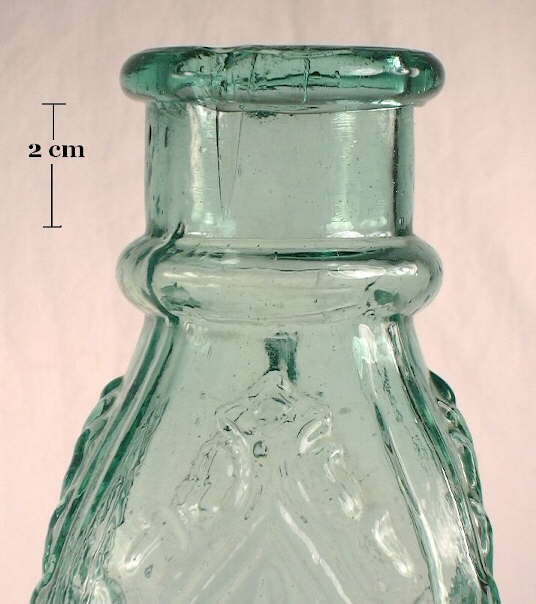 This particularly utility bottle was likely made at a Stoddard, NH. glassworks between 1840 and early 1850s. 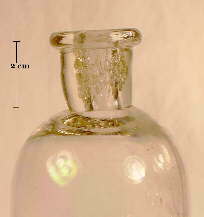 This type of bottle was usually used for ink or medicines, but could be used for a host of liquid products. 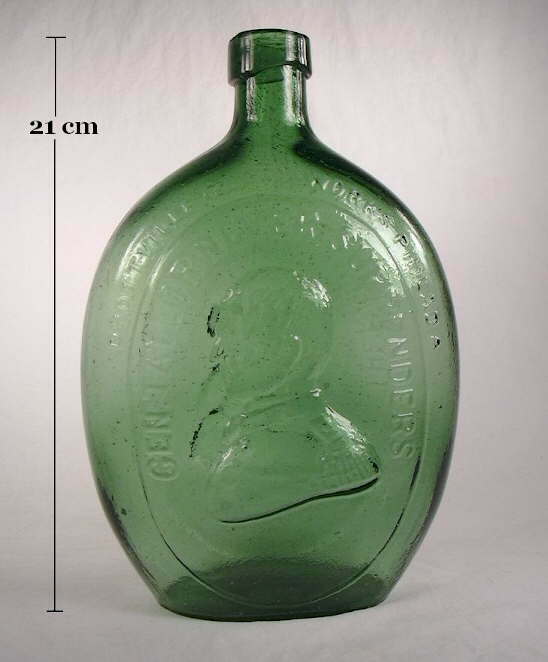 Click HERE for a picture of a very similar bottle that was used for liquor. This particular mineral finish is one of the earlier varieties with the very short upper part and crudity which left the lower portion poorly formed. This example would definitely be considered at the "squatty" end of the mineral finish type. 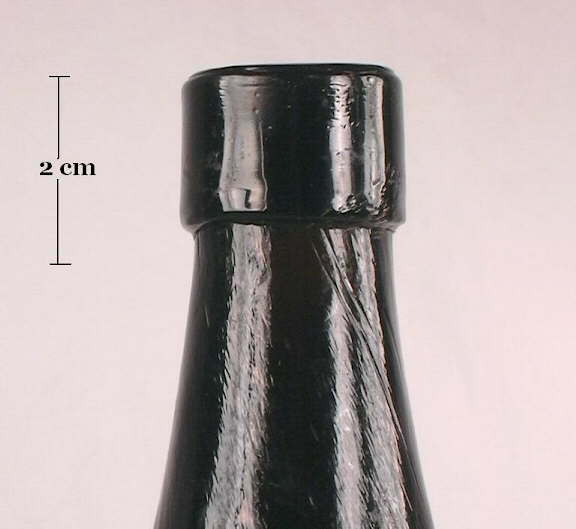 For another example, click early American ale bottle neck and finish to view the neck and finish of a ca. 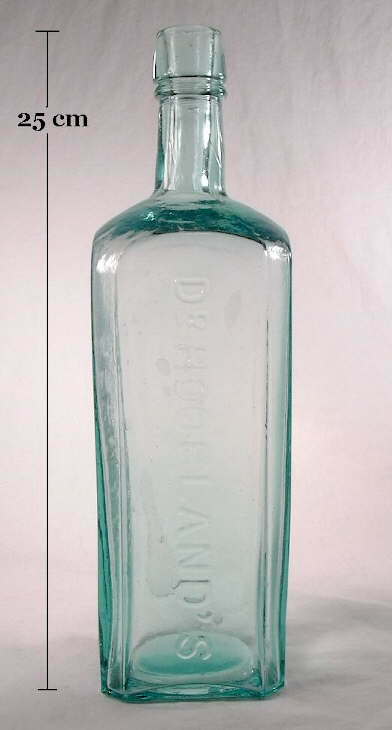 1830 American-made liquor/ale bottle that has an early mineral finish which is also very crude and a bit "vague." 3. 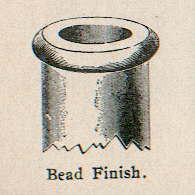 BEAD - This finish style is also called a rolled collar, extract, ring, ring finish, ring collar, flared-ring collar, donut or donut ring, single rolled collar, narrow round bead, single roll, barge lip, button finish, extract, round band, rounded collar, rolled flange, or simply a collared mouth. Click http://www.sha.org/bottle/pdffiles/IMACSfinishes.pdf to see the illustration (#3) in the IMACS table. 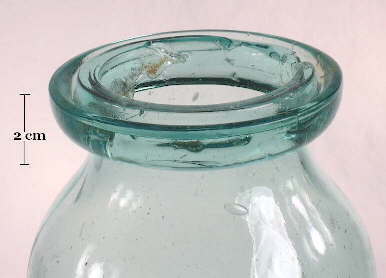 This one-part finish consists simply of a rounded ring of glass that is essentially one-half of the double ring finish (#1). The thickness (height) of the finish is relatively thin; a very thick version would be considered a blob finish (#20). A wide mouth version of this finish would be called a wide bead finish. The illustration to the right is from the 1908 Illinois Glass Company catalog. The bead finish was used much less commonly than the first two finishes above but was still a relatively common finish application. 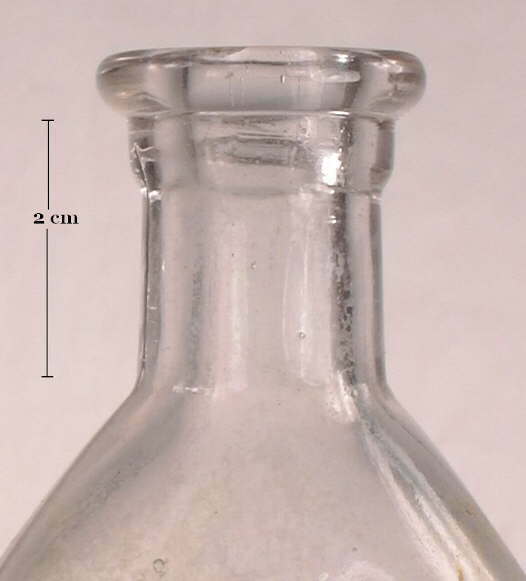 Various variants of the bead finish were primarily used on medicinal bottles but were occasionally used on other bottled products ranging from liquor to pepper sauce, foods, and condiments, to general utility bottles which were used for an array of substances. This style was used for so many years that there are no dating opportunities related solely to the style. 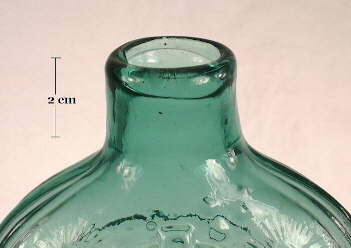 It can be found on early 19th century free-blown bottles to 20th century machine-made items. 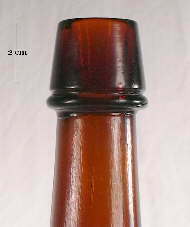 The tooled bead finish pictured to the upper left is on a Plank's Chill Tonic (Chattanooga, TN) which dates from the early 20th century (approx. 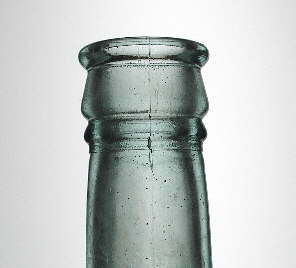 1900-1915) based on diagnostic manufacturing characteristics (i.e., the presence of a tooled finish, manganese induced colorless glass, air venting, and blown in a cup-bottom mold). 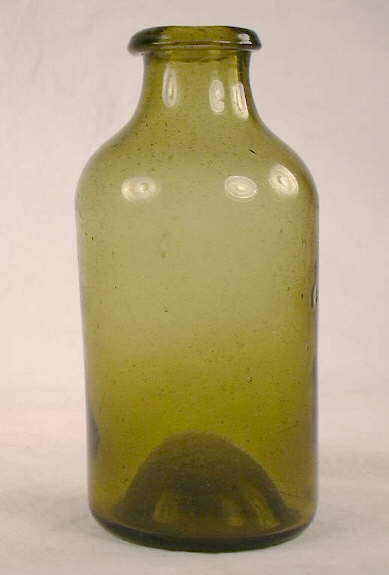 The bottle to the immediate right (olive green bottle) is an early American free-blown utility bottle with a relatively wide bore and bead finish variation with a somewhat flattened lower edge. (This could also be called a rolled flange - one of the alternative names for the bead finish.) 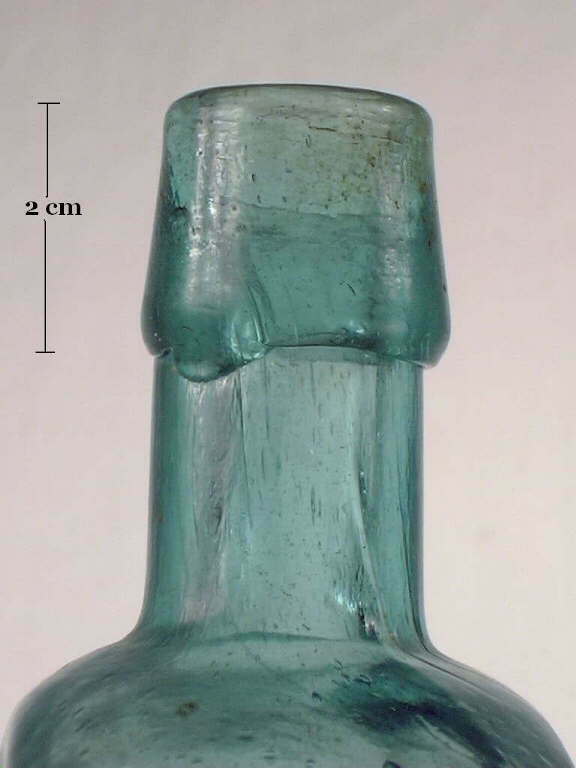 This type of bottle could have been used for anything from snuff to mustard to medicinals and likely dates between 1790 and 1820s (McKearin & Wilson 1978). The pictured bottle is also an example of a type of rolled finish (#30) which was folded outwards. 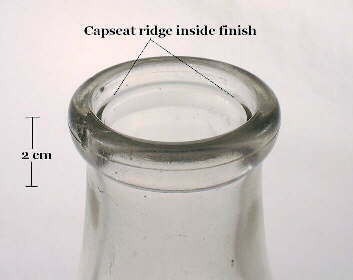 That this finish was formed by rolling the upper neck glass outwards and not formed with applied glass (i.e., applied finish) can be ascertained by running ones finger just inside the bore of the bottle and noting the absence of a crease or groove where the sheared/cracked neck and applied glass meshed. The inside portion of this particular finish is smooth and seamless to the touch indicating that the upper neck glass was simply "pushed" out from the bore and on to itself with some type of tool. The applied bead finish to the far right above (amber bottle) is on a pint liquor flask embossed J. F. CUTTER / EXTRA / OLD BOURBON (San Francisco, CA.) which dates from between 1871-1874 (Wilson 1968). 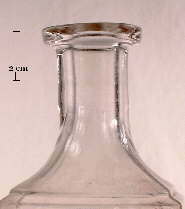 This is a good example of a bead finish, though it was a somewhat uncommon finish on liquor flasks in general. 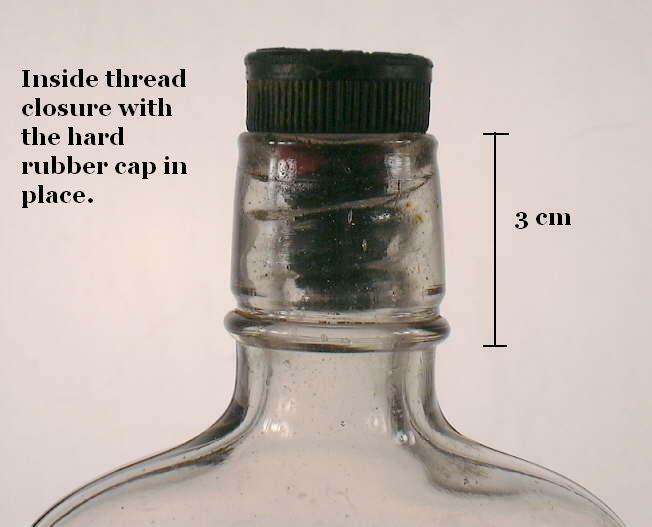 The double ring (#1), oil (#11), sheared (#15) and brandy finishes (#12) would be much more common on liquor flasks based on empirical observations. 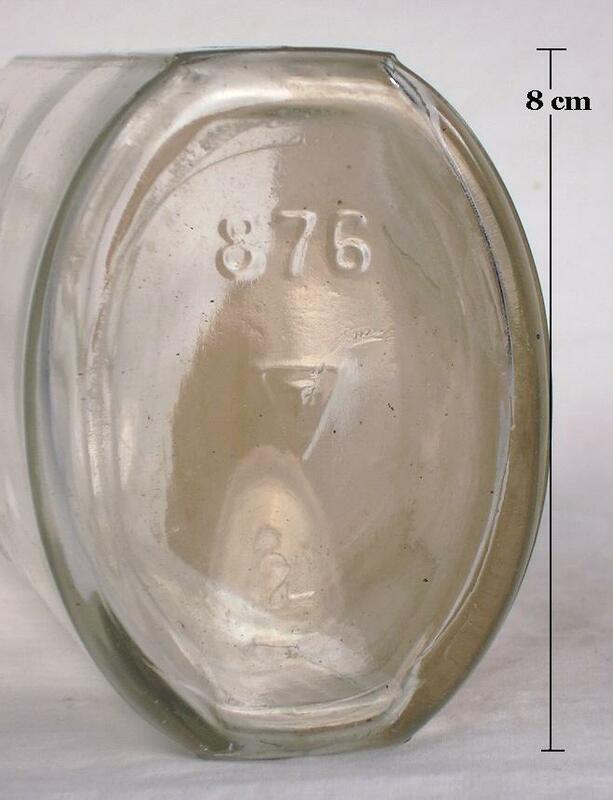 The wide bead finish and very similar one-part wide patent finish (#7) were commonly used on various food containers from the 1840s through the early portions of the 20th century and can also be found on tooled and some machine-made containers. 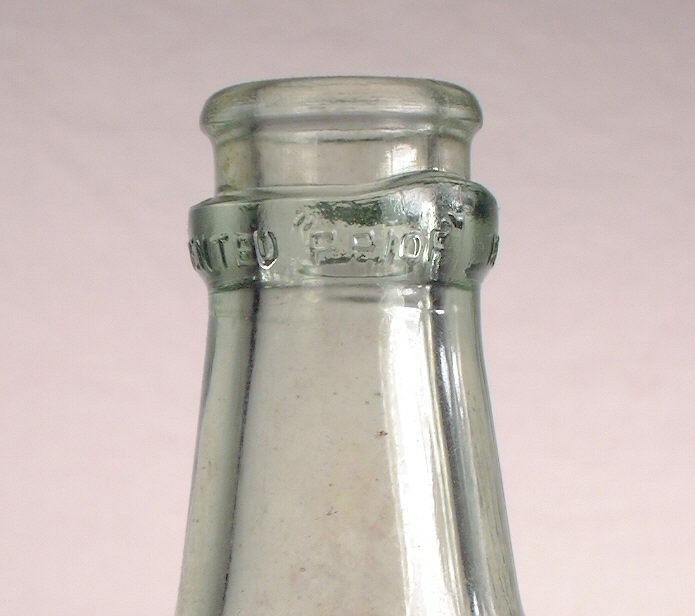 In general, the flat edged wide patent finish (covered later - #7) tends to be found on later food bottles and jars with the rounded edge wide bead finish on earlier food bottles; the latter variation is uncommon after the 1890s (empirical observations). 4. STOVE PIPE - This finish is also sometimes called a stacked finish, and for a couple Western bitters bottles, the Lacour's style finish (Wichmann 1999). Fike (1987), which was the source of the IMACS finishes illustration (click http://www.sha.org/bottle/pdffiles/IMACSfinishes.pdf to see the illustration (#4) in the IMACS table) used the term stove pipe for what other authors have called a collared ring (Pollard 1993). Due to the relative similarity of this finish to both the reinforced extract (#10) and collared ring (#24) finishes, these latter terms are more often used in the literature to describe what appears to be the stove pipe finish as IMACS illustrated (IMACS #4). This style of finish must be considered very uncommon as few examples were seen in the the preparation of this website, and then only on a few bitters bottles. 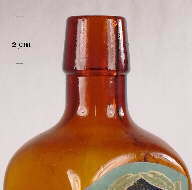 One example is the applied finish above which is on a LACOUR'S BITTERS (San Francisco, CA.). 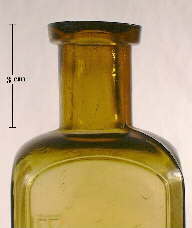 This bottle dates to 1874-1875 (Wilson 1969). 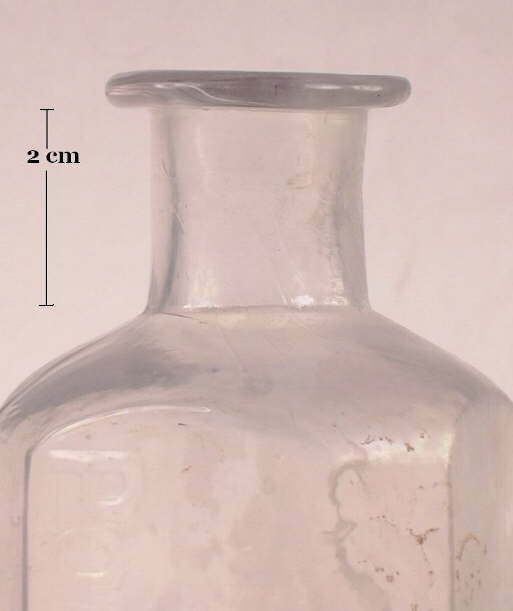 However, these type bottles are uncommon and infrequently encountered in excavations, though the author of this site has seen fragments in the 19th century mining camps of Nevada. 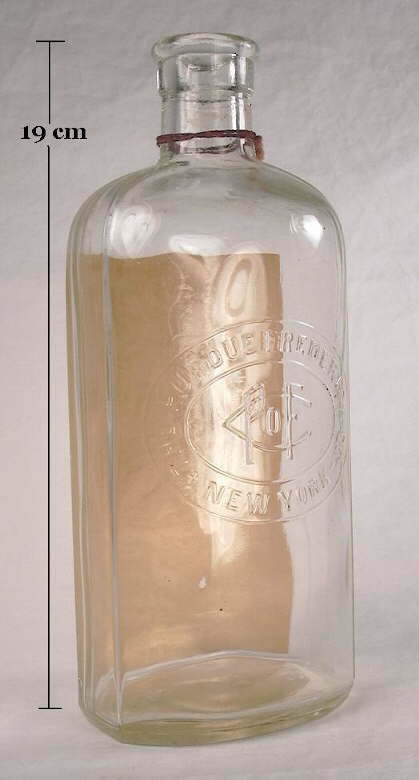 This bottle style - including the finish - was a design patented on February 4th, 1868 by Louis Lacour of San Francisco, CA. 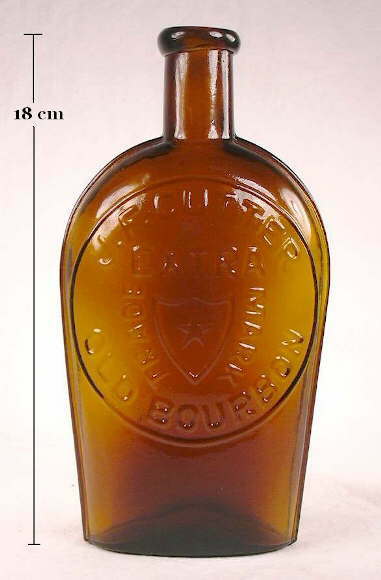 where this bottle was produced for Lacour's use. 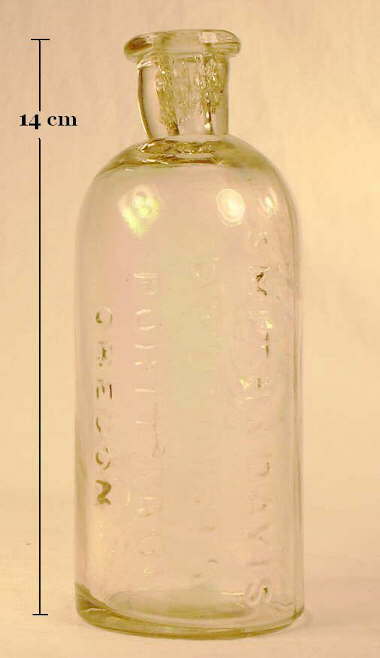 Click Lacour's Patent to see this 1868 bottle patent. 5. WIDE PRESCRIPTION or Flared - Also sometimes called a flared finish or lip, flat top finish, or a thin flared or flanged finish if it is thin. 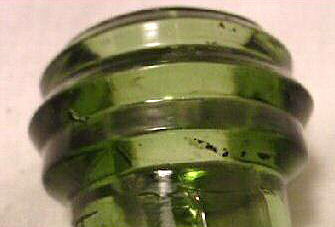 Click http://www.sha.org/bottle/pdffiles/IMACSfinishes.pdf to see the illustration (#5) in the IMACS table of this general finish which is just called the wide prescription finish. 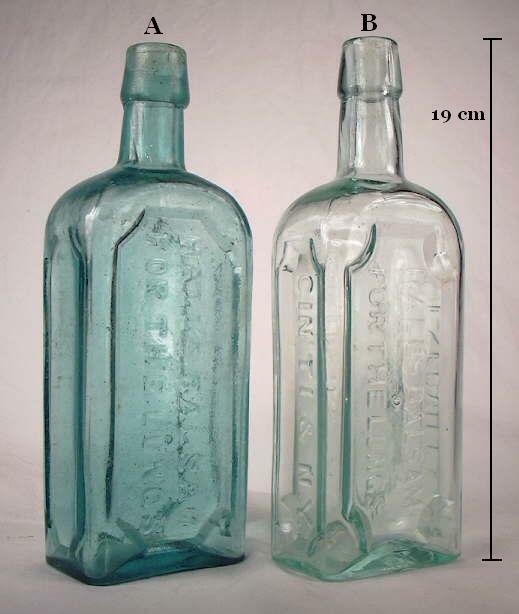 Both names (wide prescription and flared) are appropriate though different types of bottles make one or the other "more" appropriate. This type of one-part finish consists of a thin to moderate flare of glass which projects away from the top of the bore at a more or less 90° angle with a rounded or non-shaped outer edge. 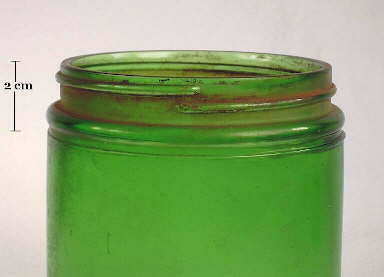 The flared or flanged finish was also covered as a method of finishing in Part I - Methods of Finishing a Bottle. This finish could essentially be considered an exaggerated version of either the patent finish (#7) or prescription finish (#9). The difference between these finish types is subtle. 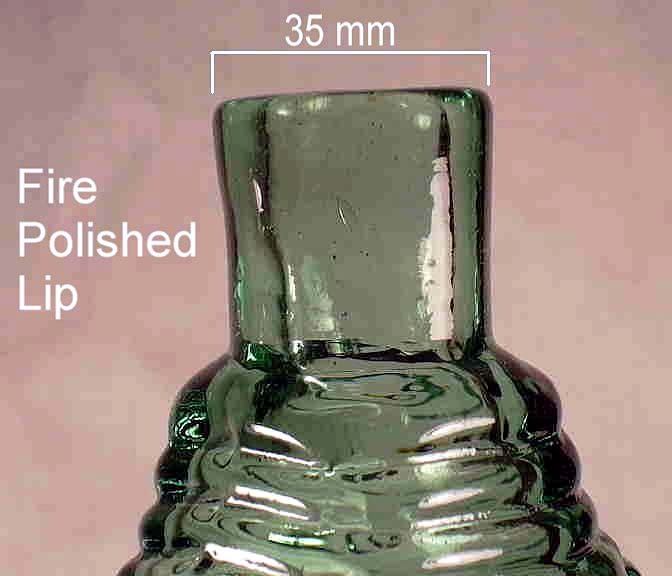 The wide prescription finish is generally much thinner glass than either of the other two types and flares out more distinctly beyond the diameter of the neck. The patent finish typically just slightly flares out a slight to moderate distance beyond the outside diameter of the neck and has an outside surface with is parallel to the neck. The "regular" prescription finish tapers narrower from the top surface to the bottom surface. The thin version of the wide prescription finish is primarily and commonly found on medicinal and druggist type bottles and vials that date between 1800 and 1870, though the style dates back to antiquity (Toulouse 1969b). It is also found on some early to mid-19th century liquor decanters, utilitarian, ink, and cologne bottles (McKearin & Wilson 1978). This style was also used on chemical reagent bottles from the late 19th through early 20th centuries (Whitall Tatum & Co. 1902). Many early case gin bottles have a type of this finish which would be more appropriately called a flared finish (discussed below). When discussing medicinal bottles, the name wide prescription finish is most appropriate; when discussing other types of bottles, the more generic flared finish is preferred. 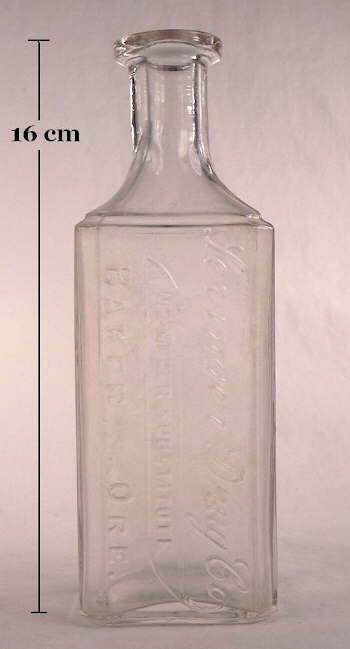 The early applied wide prescription finish to the left above (colorless bottle) is on a Smith & Davis / Portland, Oregon druggist bottle that dates from the late 1850s to maybe early 1870s. 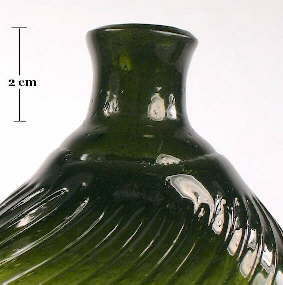 There are striations on the upper neck and finish indicating some type of simple glassmakers tool was used to form the finish though not the type of standard finishing or lipping tool commonly used in later years. This particular finish was formed from applied glass as the side mold seams end right at the base of the narrow finish and the interface between the applied glass and the blowpipe removal point is very distinct on the inside of the bore. This particular finish would be considered of a more or less average thickness for the style. See the Bottle Finishes & Closures main page for more information on lip finishing methods. The much thicker wide prescription finish to the immediate right (aqua bottle) is on a Burnett's / Cocoaine - Boston (MA.) bottle which dates from the 1870s (Wilson 1971). This particular applied finish is on the very thick end of what would be considered a wide prescription finish, though it flares out distinctly enough to be considered such and does not fit any other finish style well. An alternative classification would be to considered it an inverted prescription finish since it tapers wider from the top of the finish surface down. Jones & Sullivan (1989) called this a sloped top. This points out the complexity of finish type nomenclature in that there are endless variations and gradations between finish types and many just do not fit neatly into a category. 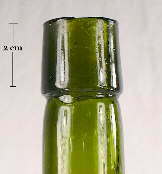 The olive green utility bottle to the far right has the classic early version of the wide prescription finish which is often called a flared finish. 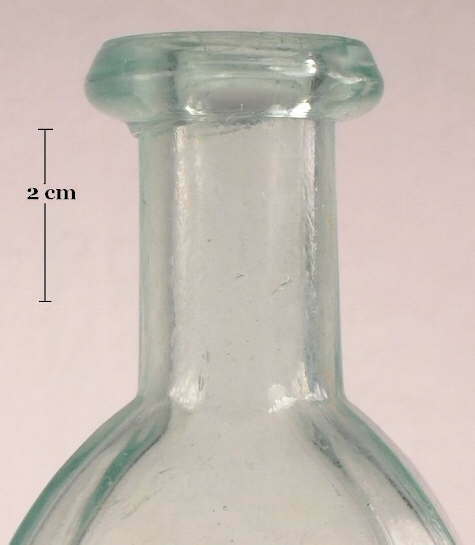 This bottle dates from approximately 1845 to 1855 and was most likely used for ink as identical bottles with ink labels have been noted (empirical observations). 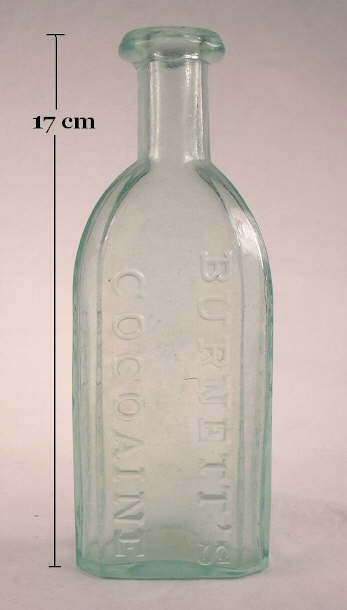 This flared finish is extremely thin and fragile which is why other finishes eventually replaced this type, like the thicker version on the Burnett's bottle above. 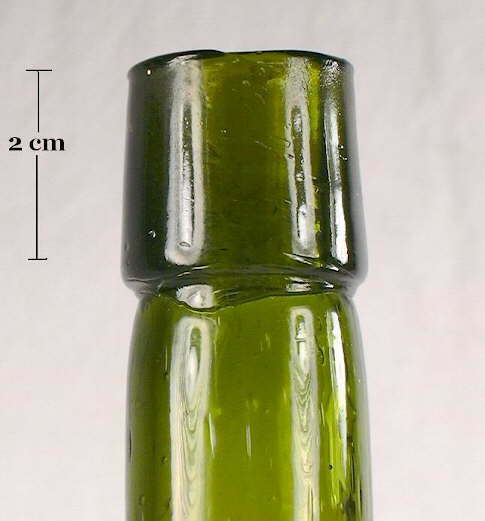 These type of very thin, flaring finishes were formed from the glass remaining after detachment of the blowpipe not with separately applied glass. This finishing method is covered in depth in the Flared or Flanged Finish portion of the Bottle Finishes & Closures main page. The applied flared finish to the left is on a "case gin" style of bottle that dates from the mid-19th century (1850-1870). 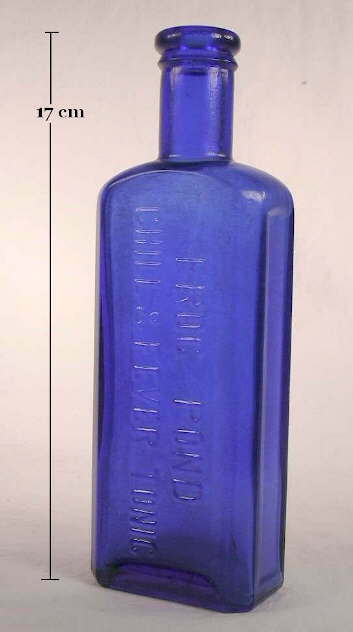 This particular finish could also be called a wide prescription finish, though the name seems inappropriate since this is not a medicine or druggist bottle. 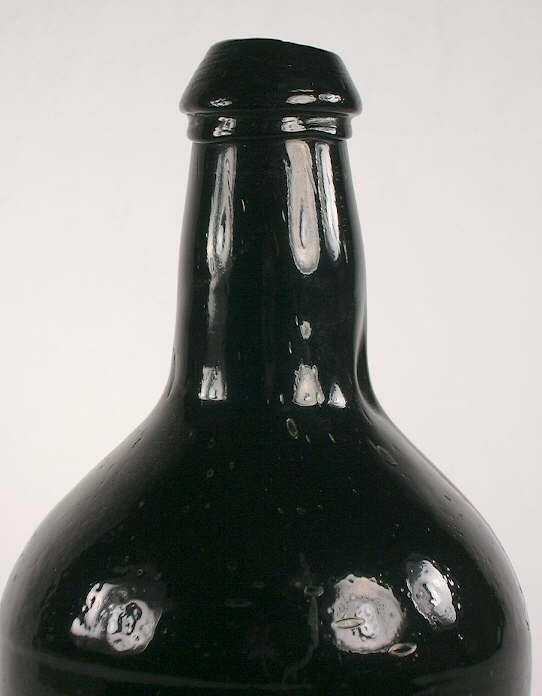 This style of distinctly flared finish was common on the earlier case gin bottles dating from the late 18th century up through the third quarter of the 19th century (empirical observations). 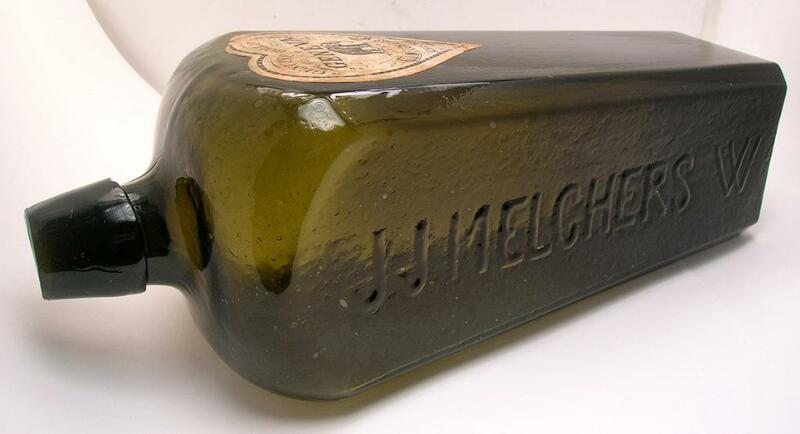 By the late 19th century case gin bottles tended to have other finish shapes including the oil, mineral, and even blob finishes. 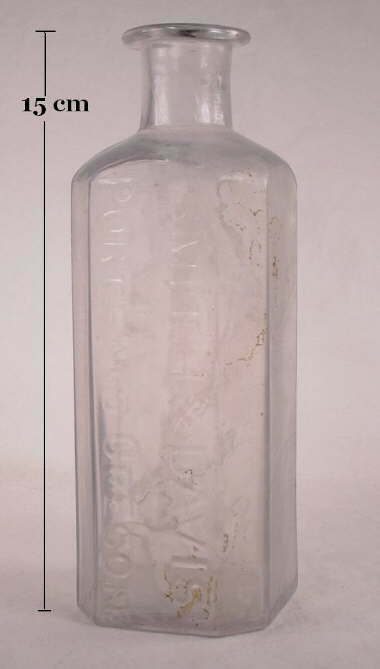 Most case gin bottles by the late 19th century were made in Europe not the U.S. Click dip mold case gin bottle to see an image of this entire bottle. 6. SHEARED RING - This one-part finish must be considered very unusual or rare. As illustrated by the IMACS, no example has been observed by the author of this site (or the illustration is stylized and being misinterpreted). The IMACS noted that this finish may be "occasionally ground". This means presumably that the upper finish surface (i.e., rim) has been ground down, which would imply that the finish itself was mold blown and the upper surface needed grinding to smooth the rough, cracked-off surface - like was needed with the Mason screw thread jar. Click http://www.sha.org/bottle/pdffiles/IMACSfinishes.pdf to see the illustration (#6) in the IMACS table. 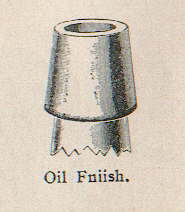 A "Ring" finish that looks almost identical to the IMACS sheared ring illustration was shown in the 1880 Whitall, Tatum & Co. glassware catalog (Pyne Press 1971) and reproduced in the illustration above. The company notes that this type finish is "...generally used on Castor Oils." 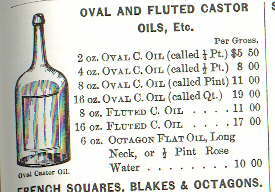 and did offer "Oval and Fluted Castor Oils..." with what appears to be this type finish (illustration to the right). 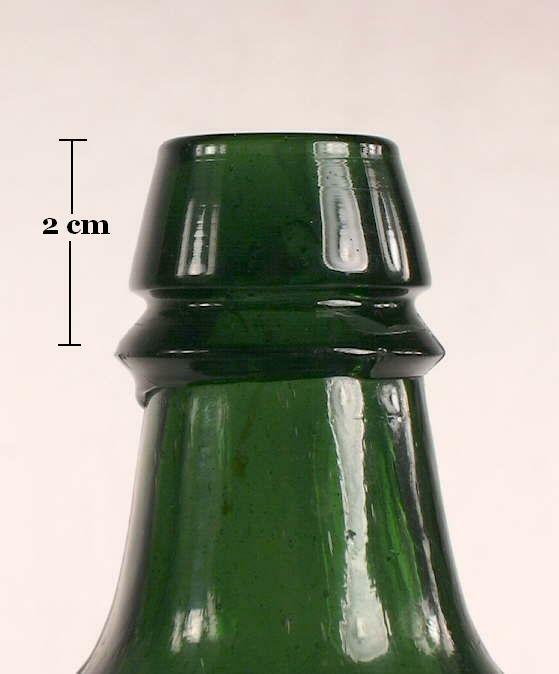 The author of this site has sometimes observed these type bottles with a steeply tapered oil finish similar to that shown in the illustrations, but never with any ground surfaces. For the purposes of this site, the non-ground sheared ring finish is considered a variation of the oil finish (#11) described below. 7. 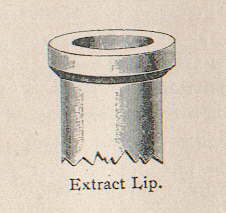 PATENT, EXTRACT or FLAT - This finish is also called a square collar, square band, square ring, squared flared-ring, packer, wide square ring, flat lip, panel lip, narrow square collar, banded finish, laid-on band, Colgate Style, cordial finish, medicine collar, and likely other names as this was a very commonly utilized finish. Click http://www.sha.org/bottle/pdffiles/IMACSfinishes.pdf to see the illustration (#7) in the IMACS table. This one-part finish consists of a usually squared off to very slightly rounded band which is just slightly - though distinctly - wider than the upper neck. A patent finish could be considered a shorter - or vertically narrower - version of the next finish - the packer finish (#8). The illustration to the right is from the 1908 Illinois Glass Company catalog and shows that company's extract or patent finish. 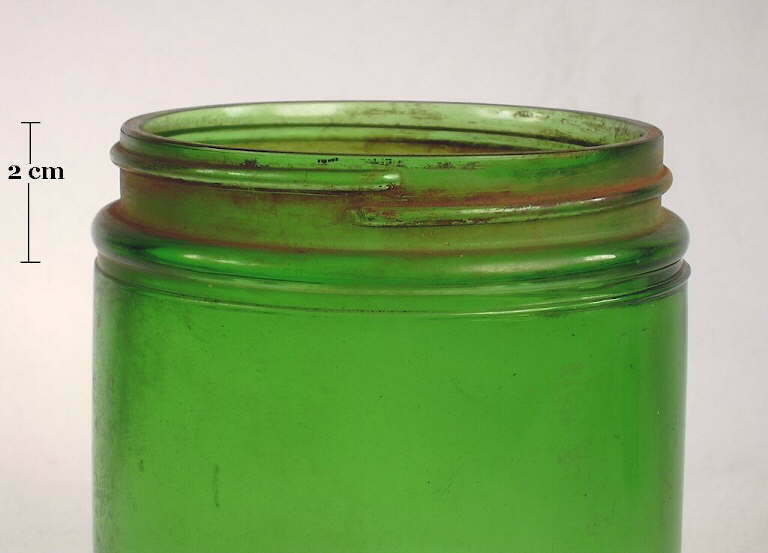 The name extract or flat finish is equally accurate to patent finish - all terms were used by glassmakers. 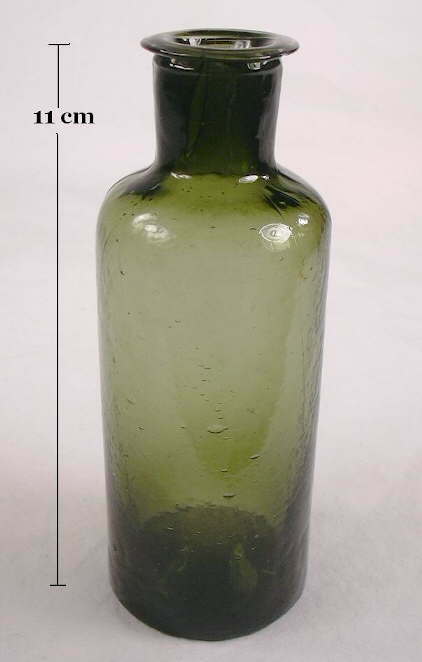 The patent finish is very common on extract and patent & proprietary medicine bottles made from about 1850 to well after the turn of the century spanning the era from pontiled bottles to machine-made items (three pictures below). 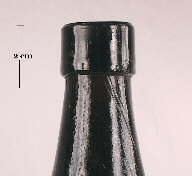 The regular patent finish can also be found less commonly on liquor bottles of all sizes, hair tonics, inks, rarely mineral waters, and assorted other type bottle on rare occasions. The wide patent finish - both with either a slightly rounded or flat edge - was also very common on various food, sauce, and oil bottles. The tooled patent finish pictured to the above left (amber bottle) is on a Wm. Pfunder / Druggist / Portland, OR. 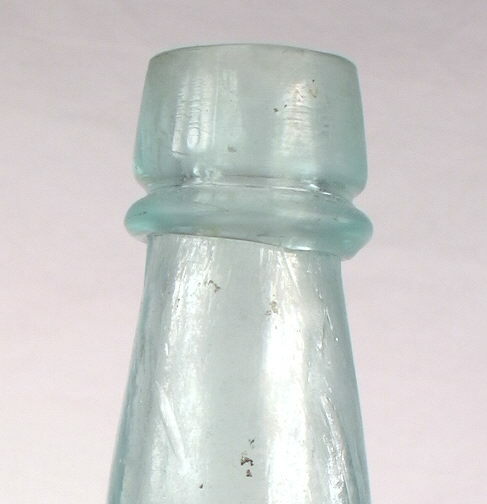 This bottle dates from the late 1880s or early 1890s and is a very typical version of this finish on a common bottle type - the "extract" or "panel" bottle - though in a somewhat uncommon color (Whitall, Tatum & Co. 1880; Illinois Glass Co. 1903). 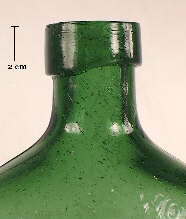 The crudely applied patent finish to the immediate right (emerald green bottle) is on an unembossed generic medicine bottle that dates from the 1850s, based on the blowpipe pontil scar on the base. This shows some of the crudeness and lack of uniformity that can be found on early finishes, though still fit the patent finish profile. The tooled patent finish in the middle right (aqua bottle) is on a Dr. Green's Blood Purifier & Nerve Tonic (Enosburgh Falls, VT.). 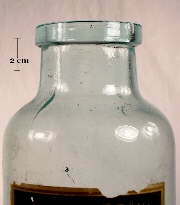 This medicinal dates from the late 1880s or 1890s based on diagnostic characteristics. 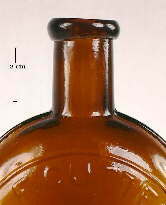 The patent finish to the extreme right above (amber bottle) is on a a label only (i.e., not embossed), machine-made S.S.S. (Swift's Specific Co., Atlanta, GA.) which dates to the 1920s. 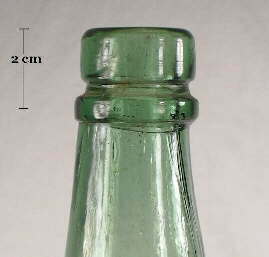 The patent finish was still commonly utilized until screw-top bottles dominated in the 1930s and was still used - though rarely - into the 1940s. It can even be found today on some decorative bottles found in "import" and gift shops. 8. 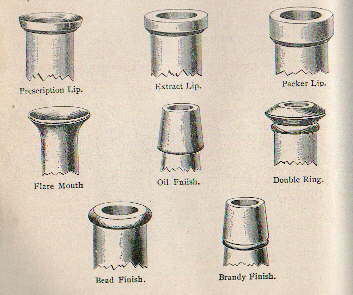 PACKER, English Ring, or Deep Lip - Also called packing finish, band finish, collar, square collar, single collar, single square collar, square finish, cordial finish (if relatively narrow like the illustration to the below right), tapered collar, and possibly short tapered collar. Click http://www.sha.org/bottle/pdffiles/IMACSfinishes.pdf to see the illustration (#8) in the IMACS table. The one-part packer finish is a subtle variation or gradation away from the patent finish (#7) above, which is vertically narrower, and the oil finish (#11), which is generally taller but distinctly flares out from top to bottom. 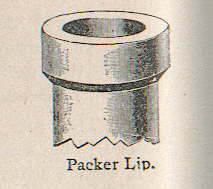 The illustration to the right is from the 1908 Illinois Glass Company catalog and shows that company's version of a packer. The primary diagnostic feature of the packer finish is that it has the same diameter from top to bottom (no flare) and is moderately tall. The outside surface of the finish is generally flat, though can sometimes be very slightly concave or convex. The flattened outside surface (of this and other flat surface finishes) of true applied versions of this finish is likely the result of the glass maker rolling the finish on the marver while the base of the bottle was secured by either a pontil rod or snap case tool (Schulz et al. 1980). Tooled versions were probably just formed completely by the lipping tool. If the outside surface is distinctly convex (bulging) then it would likely be considered a blob finish (#20) style. This is a somewhat uncommon finish primarily because it only takes a very subtle change in dimensions to become one of the several similar styles noted above. 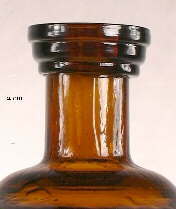 The packer finish can be found on just about any type or class of bottle that held liquid or semi-liquid products. This style of finish can also be found on bottles dating from the mid-19th century through the early machine-made bottle era (i.e., up through the 1920s). Thus, the style by itself has little utility for either dating or typing. As a general statement, there is no particular category or type of bottles that is identified with this finish; it is simply found occasionally within most classes of bottles. 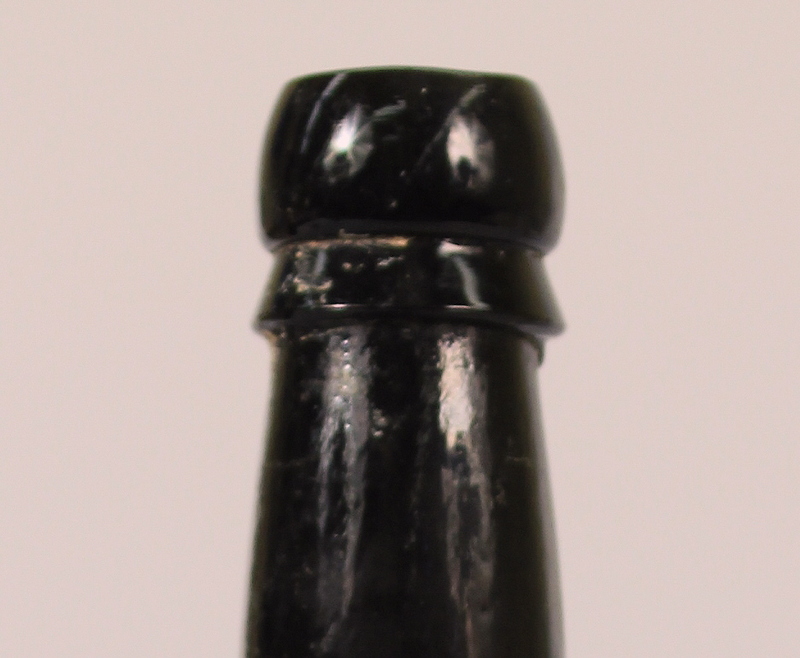 The packer finish pictured above left is on a very dark (olive amber) ale bottle that likely dates from between 1860 and the early 1870s. 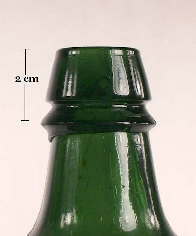 These type bottles were frequently made with this style of finish but were more commonly produced with some variation of the mineral finish (#2). 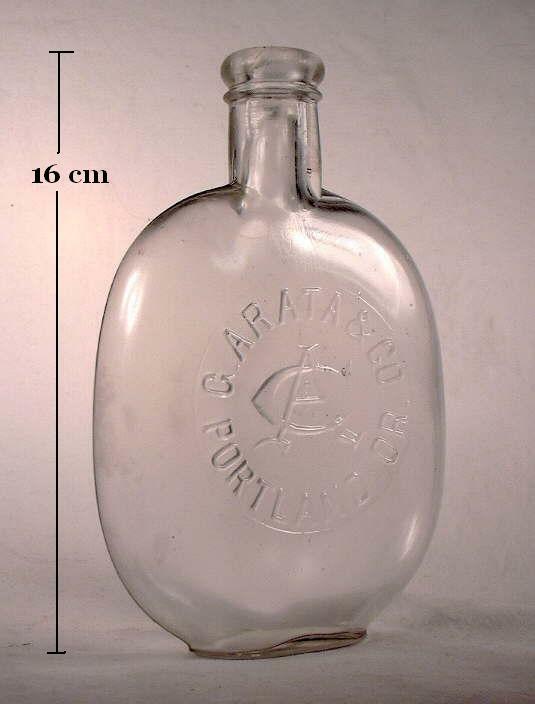 This style of bottle was commonly used for a variety of beverages (soda, mineral water, beer, ale, porter, stout) and occasionally for liquors (brandy, port, etc.) (Switzer 1974). 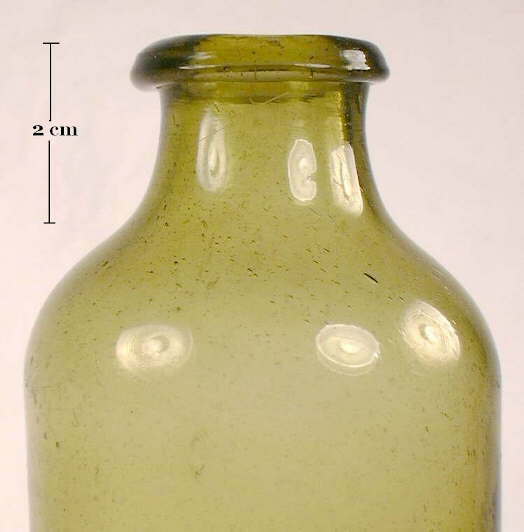 The packer finish pictured to the right (yellow green bottle) is on a figured or pictorial Washington-Taylor flask (Dyottville Glass Works, Philadelphia, PA.) which was likely blown during the 1860s and classified as GI-37 in McKearin & Wilson (1978). This particular example is on the "shorter" (vertically) end of the spectrum for this finish and could be considered a "tall" patent finish (#7). 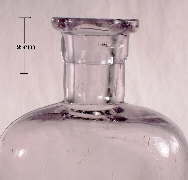 As with the ale bottle above, this type finish was frequently used on pre-1870 figured and pictorial flasks, but other styles of finishes (e.g., mineral (#2), flare (#14), straight or sheared (#15), champagne (#18)) were more commonly used. Note: Also see the wide patent finish discussion in the previous section above, which discusses the variations to either the patent or packer finishes on wide mouth/bore food bottles. What these type short one-part finishes on wide mouth food bottles/jars should be called is a point of debate, though descriptively one could simply call them a "short narrow square collar/lip." 9. 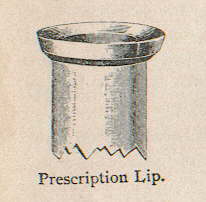 PRESCRIPTION - Also called a flared finish, medicine lip/collar/finish, single collar, single flared collar, square collar, flanged lip, flanged mouth, narrow square collar, and likely other names as this was a very commonly utilized finish. Click http://www.sha.org/bottle/pdffiles/IMACSfinishes.pdf to see the illustration (#9) in the IMACS table. The primary diagnostic feature of the one-part prescription finish is that it is moderately narrow (vertically) and the outside surface distinctly tapers in (i.e., gets narrower) from the top surface of the finish to bottom. The outside surface edge of this finish is typically flat though can be sometimes slightly rounded. The top surface of the finish also typically tapers into the bore. Schultz et al. (2016) succinctly describe it as a finish "...in which the side of the finish flares upward, while the upper surface tapers inward." 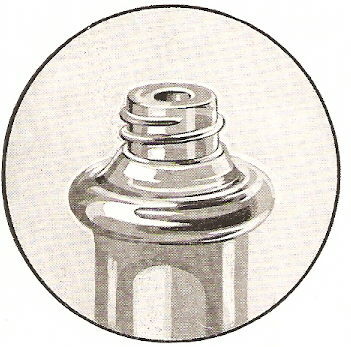 This is shown in the illustration to the above right which is from the 1908 Illinois Glass Company (I.G.Co.) catalog and shows that company's prescription lip or finish. This finish is similar to - and gradates into - several other finishes: the patent finish (#7 - which is not tapered), the wide prescription finish (#5 - which is vertically thinner), the bead finish (#3 - which is rounded on the outside surface and the vertically symmetrical), and to some degree, the packer finish (#8 - which is not tapered and vertically taller). An excellent way to compare and see the differences is by viewing the 1908 I.G.Co. finish illustration which was also pictured at the top of this page. 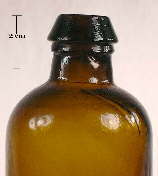 The prescription finish is the most common finish on druggist, drug store, and prescription bottles made between the mid-1870s and the effective end of the mouth-blown bottle era in the early 1920s, though by the early 20th century other finishes were becoming common on these bottles - particularly the reinforced extract finish (#10). A 1909 catalog advertised this finish as "A wide flaring cup-shaped mouth, with thin edge, suitable for dropping" (Alther 1909). The flaring mouth facilitated pouring exact quantities of the medicine, even counting the drops (Berge 1980). 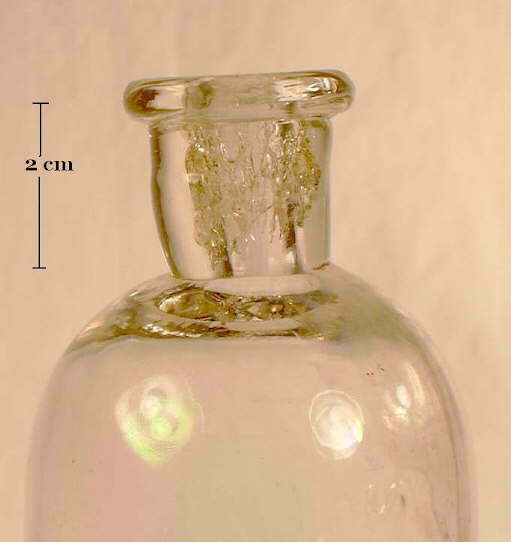 This style is also common on patent and proprietary medicinal and poison bottles, and many bitters (a type of medicine), ink, and perfume/cologne/toiletry bottles from the same era. It can be found occasionally - though rarely - on liquor bottles & flasks and some food and sauce bottles. This finish is almost always found as a tooled finish and seems to have actually appeared concurrently with that finishing style; true applied versions are very uncommon. It is also appears to be somewhat uncommon on machine-made bottles, though more commonly than on applied bottles (empirical observations). The prescription finish pictured to the upper left (cobalt blue bottle) is on an Owl Drug Company (San Francisco, CA.) "poison" bottle from ca. 1892-1908. 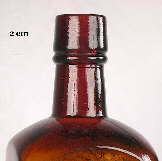 The prescription finish is one of the most common finishes on poison bottles. Poison bottles held a myriad of different substances whose only common theme was that they were poisonous if taken internally by humans. 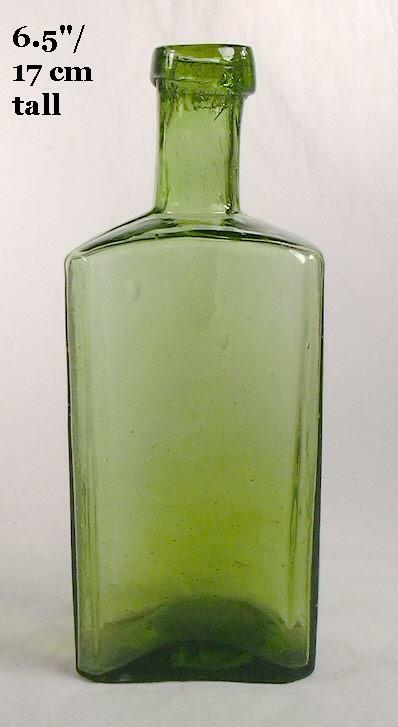 The shape and color of poison bottles were intended as visual and physical indicators that the contents were only for external or non-human use (Munsey 1970). 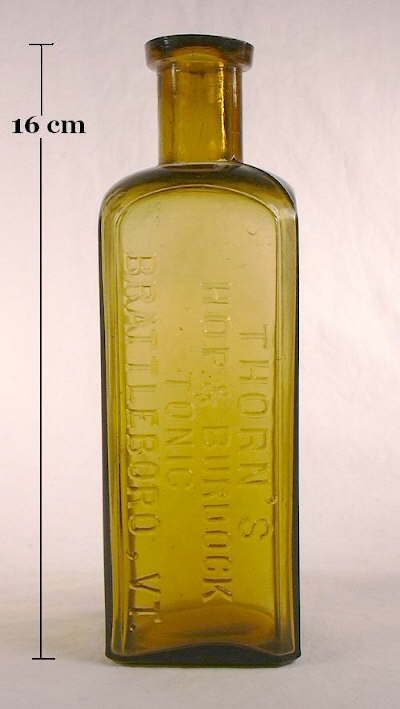 The prescription finish pictured to the left (yellow bottle) is on a proprietary medicine - Thorn's Hop & Burdock Tonic (Brattleboro, VT.) which likely dates from between 1885 and 1895. This finish was probably second only to the double ring (#1) in its use on patent and proprietary medicinal bottles during the era between about the late 1870s and 1910s. 10. REINFORCED EXTRACT - This finish is also sometimes called a ring and collar finish, bead with collar, collared ring, rounded collar above a flat band, re-enforced lip, and less accurately, a double collar. Click http://www.sha.org/bottle/pdffiles/IMACSfinishes.pdf to see the illustration (#10) in the IMACS table. Visually interpreting the IMACS, the reinforced extract finish is a bead (#3) (picture to the left) or on top of a moderate to tall packer finish (#8). The reinforced extract finish shares similarities with the stove pipe (#4), club sauce (#33), and collared ring finishes (#24). This latter finish is almost identical to the reinforced extract finish except may have a somewhat shorter collar (lower portion of the finish). The reinforced extract finish is generally two-part, but some could be considered to have three parts (picture below right). However, some of the three-part versions could also be considered a club sauce finish (#33), though a "classic" club sauce finish would have a middle portion which is distinctly taller than that shown on the amber medicine bottle pictured below. This is the type of variety and cross-over that makes finish classification difficult or confusing, doesn't it? 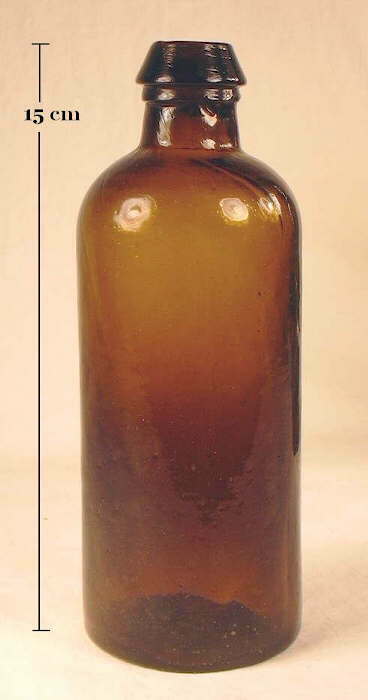 The reinforced extract finish was somewhat uncommon on mouth-blown bottles and seems to be found primarily on proprietary medicine and druggist bottles that date from about 1900 through the end of the mouth-blown bottle era - the late 1910s to early 1920s (Whitall Tatum Co. 1902, 1909, 1913, 1924). 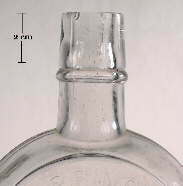 A variation of this finish also shows up on liquor flasks from the early 1900s. 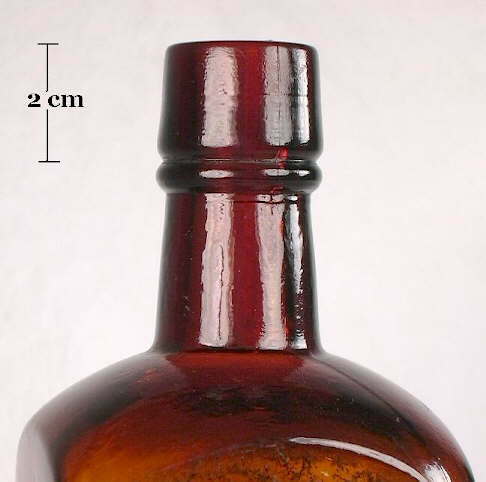 Like the prescription finish (#9) above, the reinforced extract finish is also much more common in mouth-blown bottles as a tooled finish than as an applied finish, though the latter has been observed. 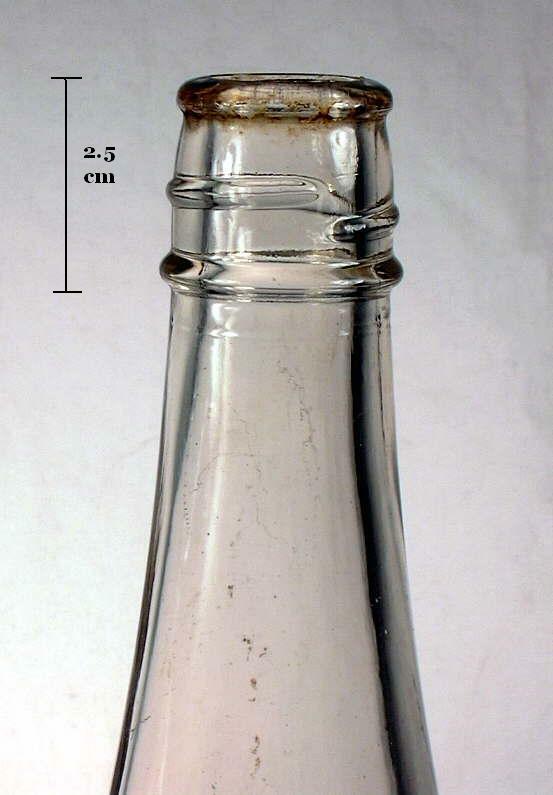 It is frequently observed on earlier machine-made bottles manufactured between the mid-1910s through the 1920s (Whitall Tatum Co. 1924; empirical observations). The reinforced extract finish pictured above is about as close as a bottle can get to the finish illustrated in the IMACS list with a rounded "bead" upper part and a moderate length lower part or collar. It is on a machine-made Gray's Glycerine Tonic Comp. 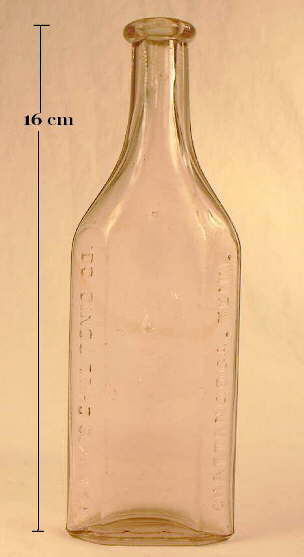 bottle (New York, NY) and dates between 1915 and 1929. 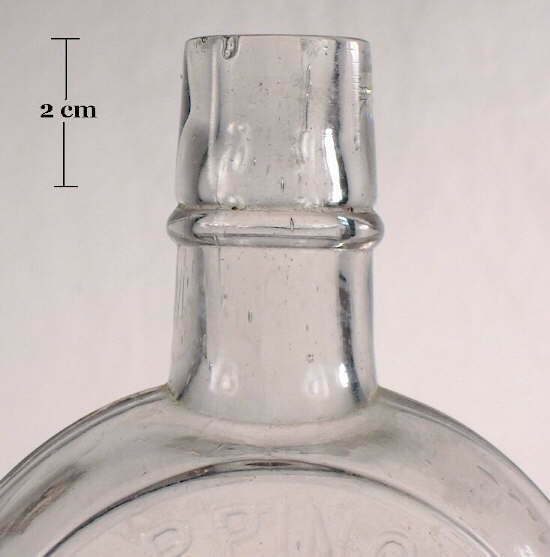 This bottle has a makers mark on the base ("T" in a triangle) that identifies it as a product of the Turner Brothers Glass Company of Terre Haute, IN. who used this particular mark between the dates listed (Toulouse 1971). This bottle also has the label which identifies the product as for internal use and good for "...conditions of deranged function...". 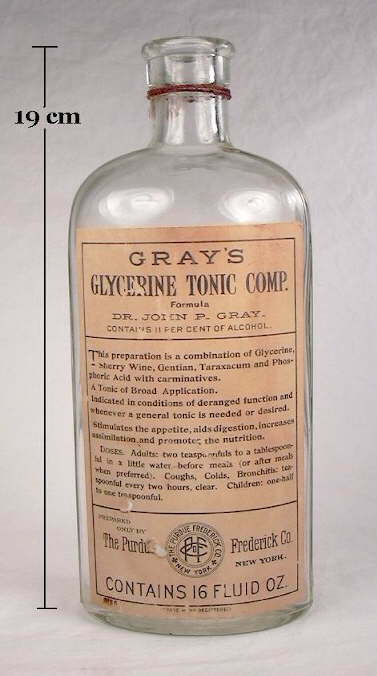 Click Gray's Tonic Label to see the label. 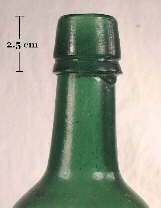 Though the reverse side of the bottle is embossed with the company name and location, it does not state the product it contained. This is the utility of labeled bottles in determining what "type" of bottle one has when missing the original label. See the Labeled Bottles sub-page for more information on the subject. 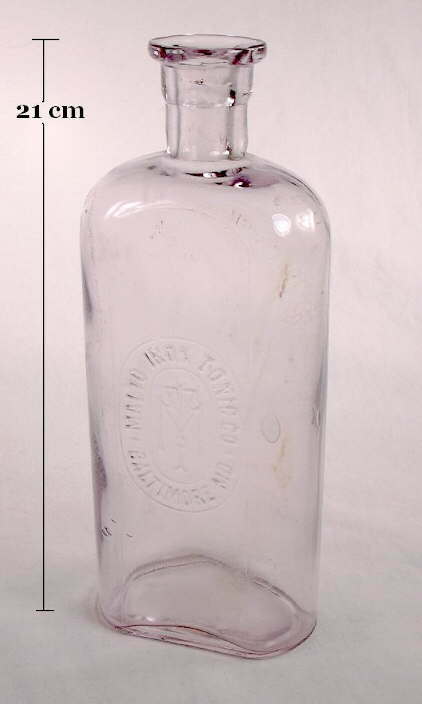 The reinforced extract finish variant pictured to the left (colorless bottle) is on a mouth-blown proprietary medicine bottle - Malto Iron Tonic (Baltimore, MD) that likely dates from the early years of the 20th century, i.e., 1900-1915. 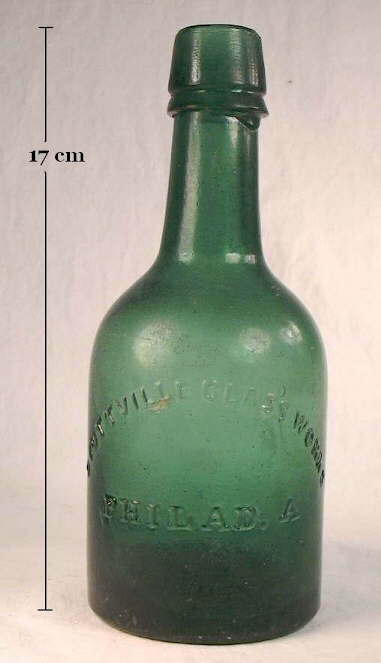 This shape/style of bottle (called a Philadelphia Oval by glass manufacturers) was very commonly used by druggists during the era from 1880s to 1920, though this style was much more commonly made with a prescription finish (#9) (Illinois Glass Company 1903, 1908, 1911). This specific finish fits the reinforced extract finish better than the others on the Finish Types pages but really looks looks like a prescription finish with a collar (lower part) below to "reinforce" the upper part. Maybe "reinforced prescription finish" would be a better name? The upper part is flared like a prescription finish and much more than the "typical" reinforced extract finish pictured above. The finish rim has a slight inward sloping towards the bore which is typical of a prescription finish. 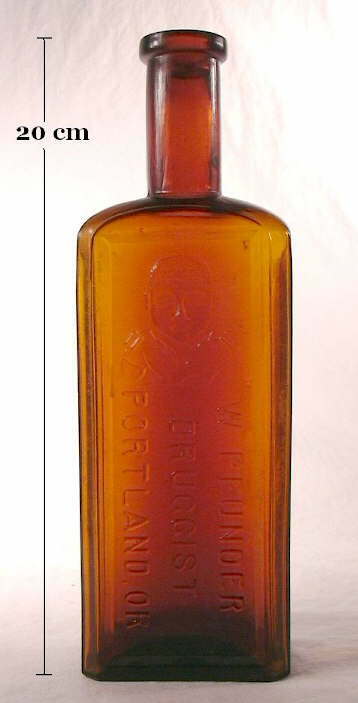 The reinforced extract finish variant to the right (amber bottle) is on a similarly shaped (to the Malto Iron Tonic) proprietary medicine bottle - an Oregon Blood Purifier (Portland, OR.). 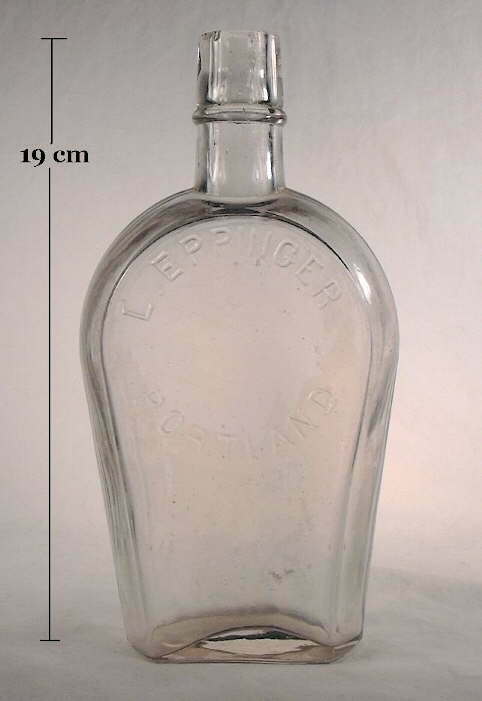 This bottle likely dates between 1885 and 1890 based on company history and other diagnostic features (Wilson & Wilson 1971). 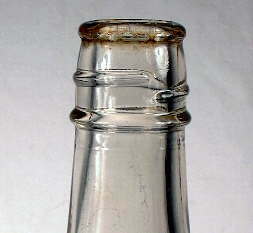 The finish on this bottle is also slightly different than both the above bottles in that it has a narrow third ring portion below the other two parts of the finish. 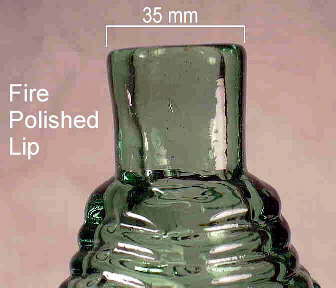 This bottle's finish was made with a ridge inside the bore which is even with the lower ring. 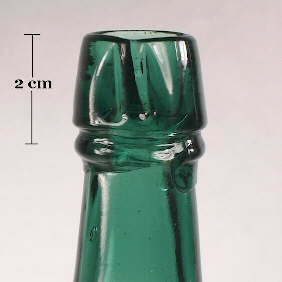 This ridge allowed for a glass stopper with a cork sheathed shank (the cork was called a "shell cork" in glass making catalogs) to be inserted and seal against the ridge (Illinois Glass Co. 1920). 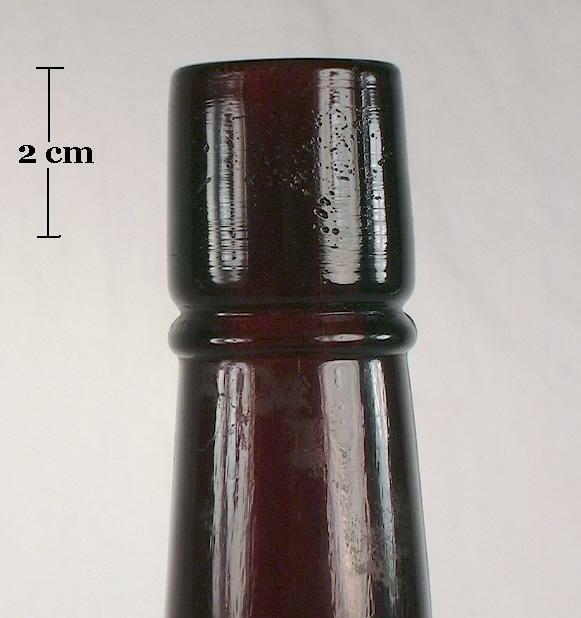 This finish is very similar to the club sauce finish (#33), which also accepted a glass stopper and shell cork, and may be better referred to as that - except that this was not a sauce bottle. As noted above, this finish is similar to and grades into several other types of finishes, making it difficult to discretely name this - and many other - types of finishes. 11. OIL or Ring - Also called a tapered collar, long tapered collar (LTC), plain broad sloping collar, tapered top, brandy, graduated finish, wine finish, square collar, castor oil, and likely other names as this was also a very commonly utilized finish. Click http://www.sha.org/bottle/pdffiles/IMACSfinishes.pdf to see the illustration (#11) in the IMACS table. This one-part finish is distinguished by its height being about equal to or more than it's width, with a gradual wider taper towards the base. The outside surface of the finish is usually flat, though it is often slightly concave (like in the picture to the left) or with very slight rounding. 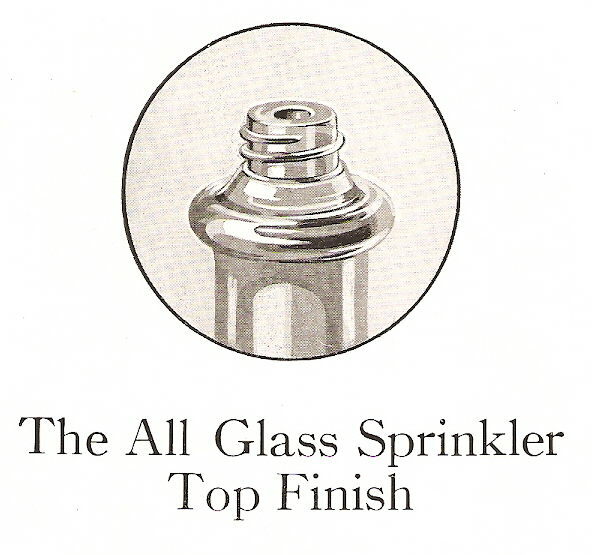 The illustration to the right is from the 1908 Illinois Glass Company catalog and shows that company's oil finish (note misspelling) and is very typical for the style. The oil finish is similar to the packer finish (#8), with the latter finish having a width that is equal to or wider than its length and little if any flaring or taper. The brandy finish (#12) is essentially a two-part version of the oil finish made distinctive by the addition of a narrow ring collar. 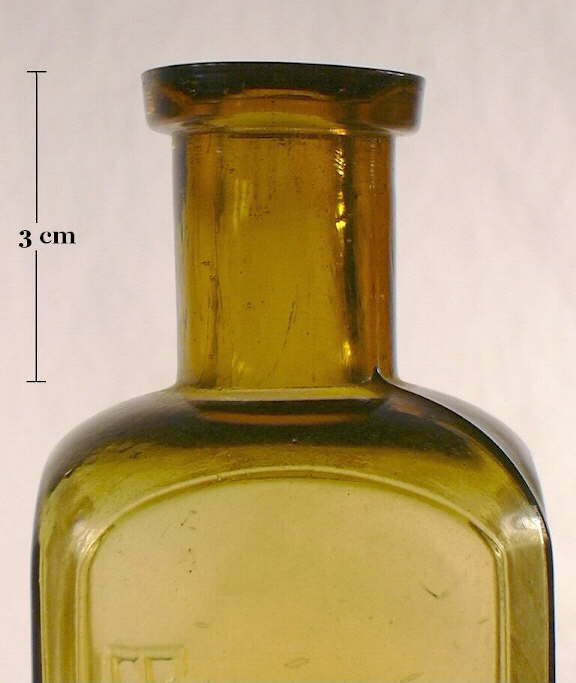 The oil finish was one of the most commonly used finishes on a wide array of different type bottles from the 1830s until the 1920s (particularly between 1850 and 1920) when it was largely replaced by various external thread finishes (#16 & #17). 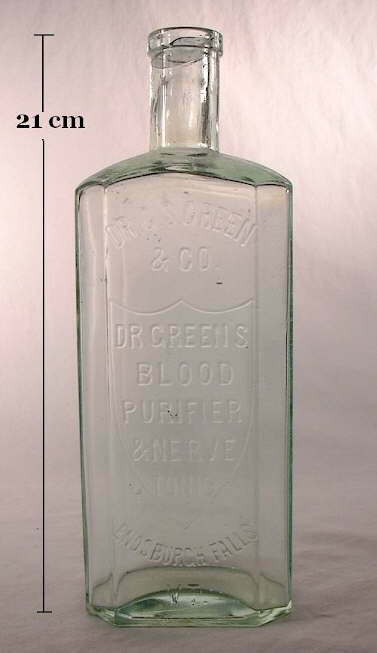 This finish was very commonly used on all types of proprietary and patent medicines (bitters, tonics, cures, balsams, etc. ), some liquid/sauce type food bottles, large ("bulk") ink bottles, occasional liquor & figured flasks (commonly on gin bottles; example below), and less frequently on just about any other class of liquid containing bottles. 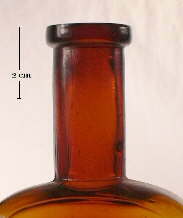 Larger examples were sometime called a "wine finish" (Fairmount Glass Works 1910). It is rarely if ever seen on small ink or perfume/cologne bottles, wide mouth food bottles, beer bottles, and druggist and drugstore bottles. However, because of its relatively wide application and wide period of use, this finish style has limited utility in the dating or typing of a bottle; other diagnostic features must be used. The applied oil finish to the above left (blue aqua bottle) is on a Hall's Balsam for the Lungs (New York & Ohio) that likely dates between 1865 and 1875. 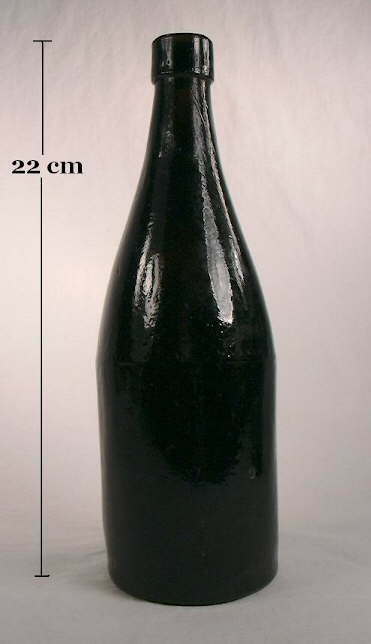 (Note: this bottle is used as a dating example on the Examples page. See that page to see how the date range for the Hall's was determined.) 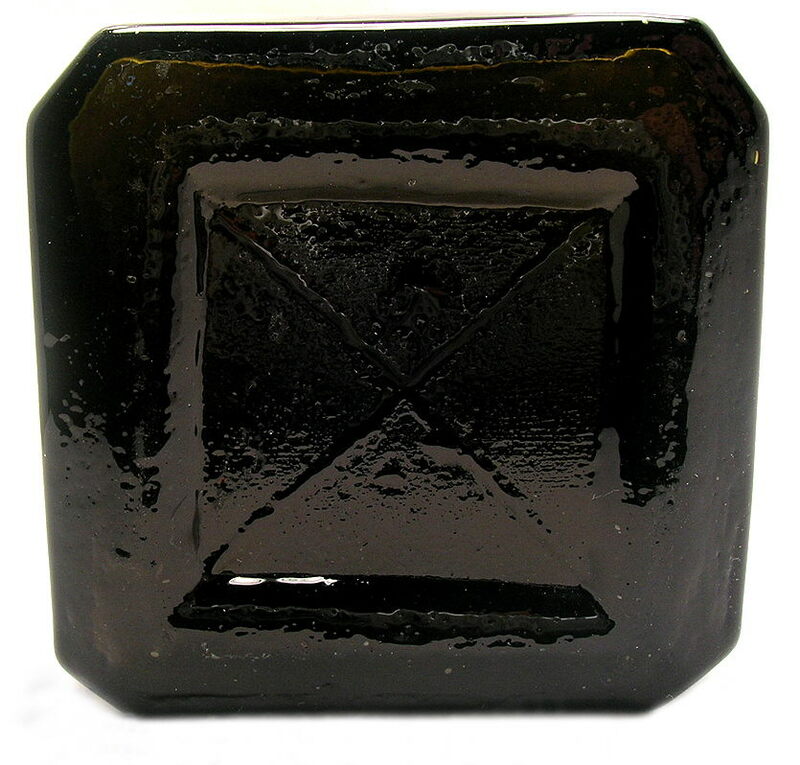 This style of finish was commonly used on very similarly shaped rectangular (and square) patent or proprietary medicine bottles dating from about 1850 (with pontil scars) to the 1920s (machine-made bottles). 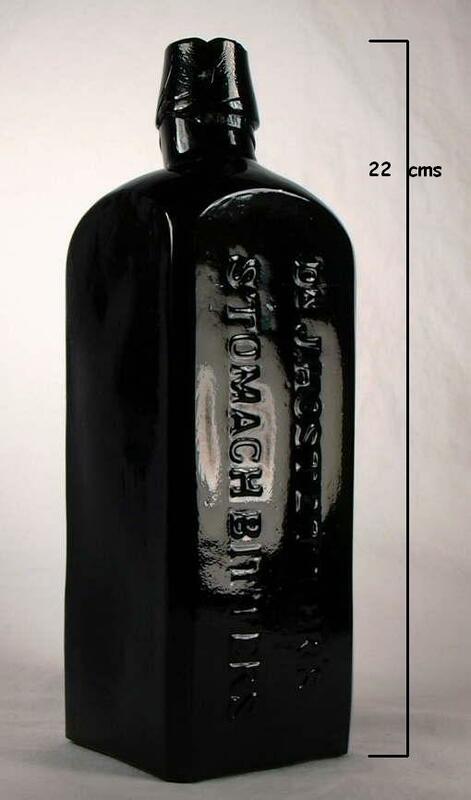 The crudely applied oil finish to the immediate right (black bottle) is on a Hostetter's Stomach Bitters (Pittsburgh, PA.) that likely dates between 1865 and 1870. (Note: this bottle is also used as a dating example on the Examples (pop-up) page.) 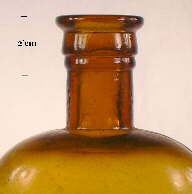 The oil finish with the brandy (#12) and patent (#7) finishes were probably the most common finishes found on American bitters bottles made from the 1850s into the 1920s. 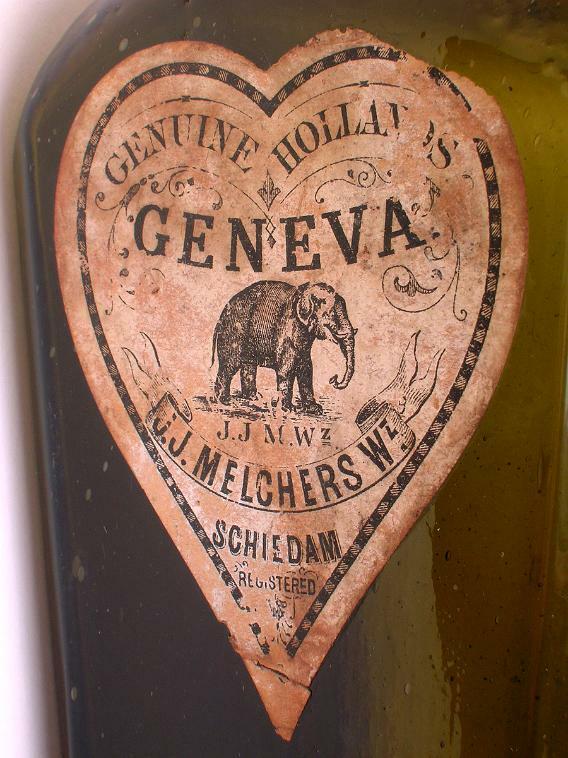 Bitters were a quasi-medicine with generally high levels of alcohol - sometimes 40% (80 proof) or more! 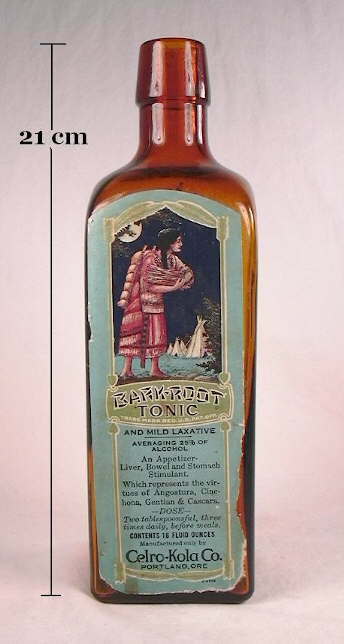 A Hostetter's label at the turn-of-the-century noted that the 39% alcohol was "...only sufficient to hold in solution the extracted medicinal properties of barks, roots, herbs, and seeds contained therein". This was stated as such to apparently justify the alcohol content during that time of ever rising Prohibitionist or Temperance fervor. 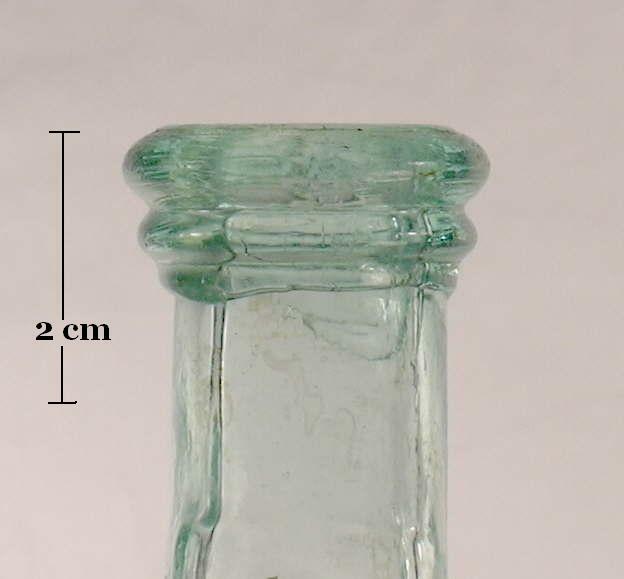 The crudely applied oil finish to the far right above (emerald green bottle) is on a probable sauce bottle that dates from the 1850s or early 1860s (it has a glass tipped pontil scar on the base). 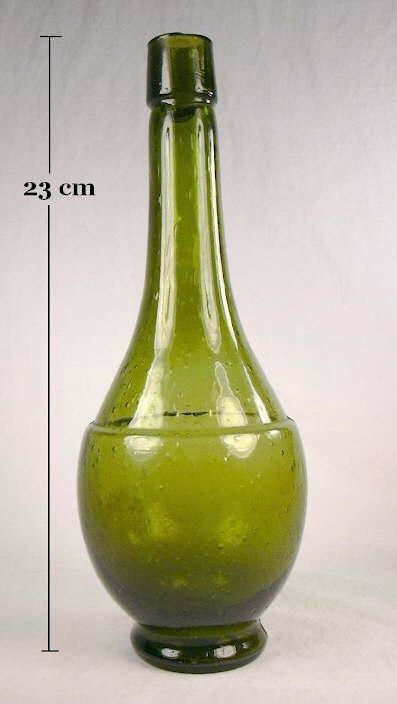 The bulbous body of this bottle is an unusual shape for the mid-19th century, though there were an assortment of similar shaped bottles known to be used as sauce containers during that era (Zumwalt 1980). The oil finish is, however, typical as to shape and size. 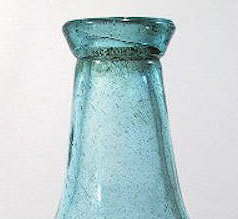 The variation of the oil finish pictured to the left is typical of the finishes found on virtually all Codd patent soda/mineral water bottles. This finish is wider and bulkier than the other oil finishes noted here, but the overall conformation is similar; thus it's inclusion here. 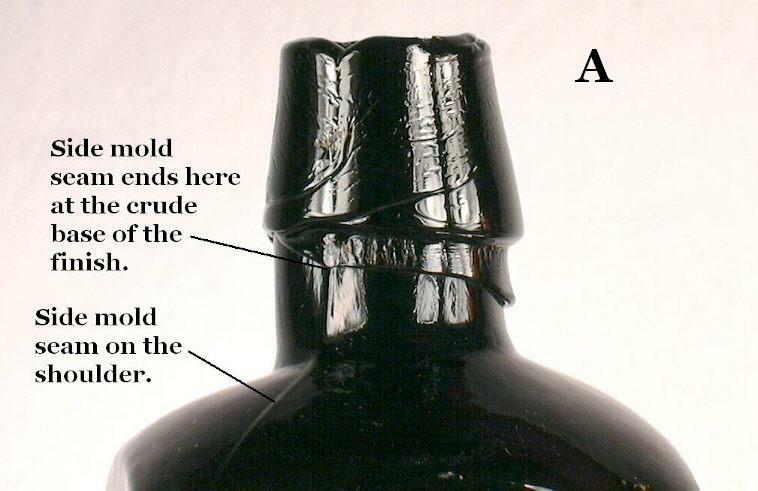 The "Codd finish" is almost a transitional form between the oil and the blob finishes (#20) All Codd bottle finishes have an indented groove inside the bore in which a rubber gasket was placed - this shows in the picture. The carbonated contents of the bottle pushed the marble firmly against that gasket and tapered bore of the bottle sealing those contents securely. 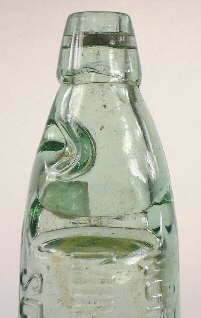 For more information on this bottle style view the "Codd Style" bottle discussion on the Bottle Typing/Diagnostic Shapes: Soda & Mineral Water Bottles page. First, the base of this bottle has an Owens suction scar and is embossed with a glass makers mark identifying it as a product of the Illinois-Pacific Glass Company (San Francisco, CA.) which used this mark between 1902 and 1930 (Toulouse 1971). This company was closely aligned with the Illinois Glass Company (Alton, IL.) which was first licensed to produce bottles with the Owens Automatic Bottle Machine in 1910 or 1911 (Toulouse 1971; Miller & McNichol 2002). 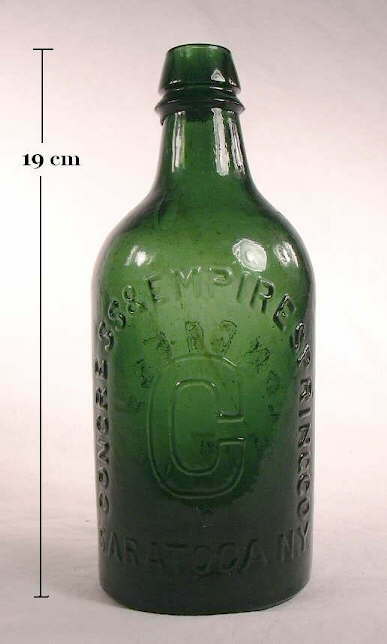 This indicates that the bottle is unlikely to predate 1911. 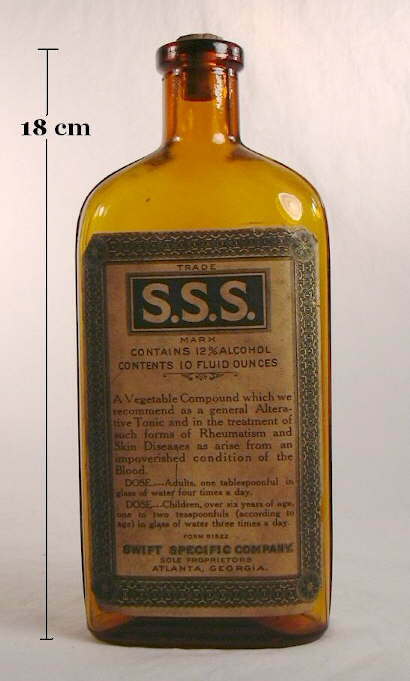 Second, the label has the muted medical claims typical of patent medicines produced after the 1913 "Sherley Amendment" to the Pure Food & Drugs Act of 1906, allowing for a bit more dating refinement (White 1967; Fike 1987). 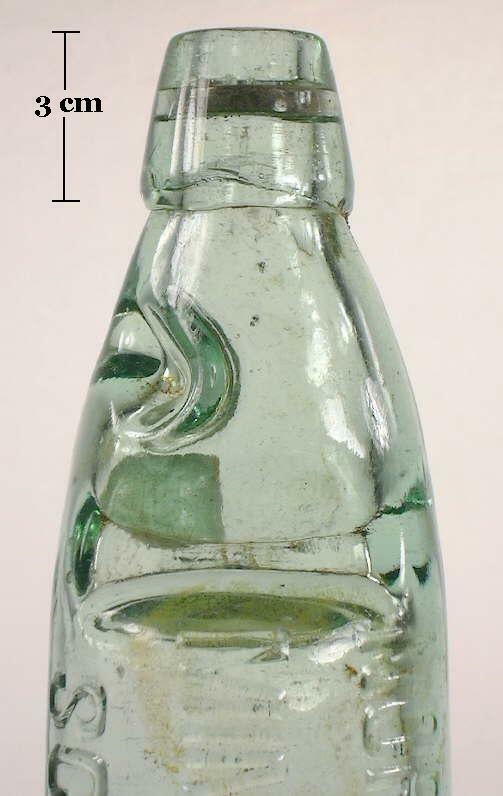 Third, Ron Fowler's book on Oregon Soda Bottlers (1975) indicates that the Celro-Kola Company was formed in 1915 and lasted until 1929. This gives the bottle some absolute sideboards for dating - assuming the dates are accurate. 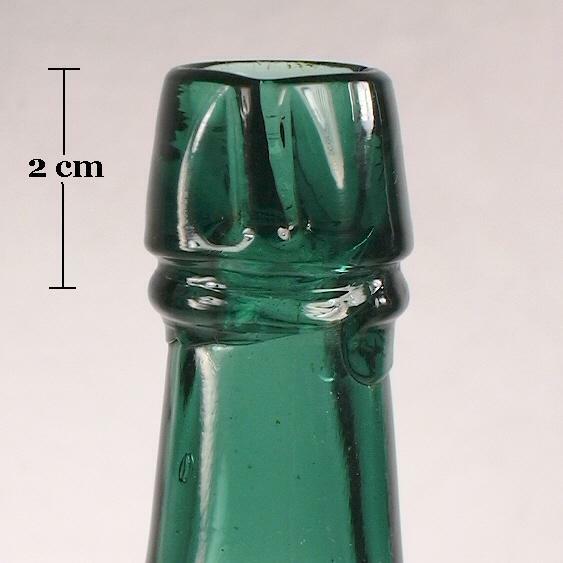 Finally, as noted in the machine-made section of the "Bottle Dating" page (Question #12), cork sealed bottles were unusual after the 1920s. Empirical observations indicate that this type of bottle - tall, square, amber glass, bitters & medicinal - were largely made with screw caps after the mid to late 1920s (see the Bottle Typing page). 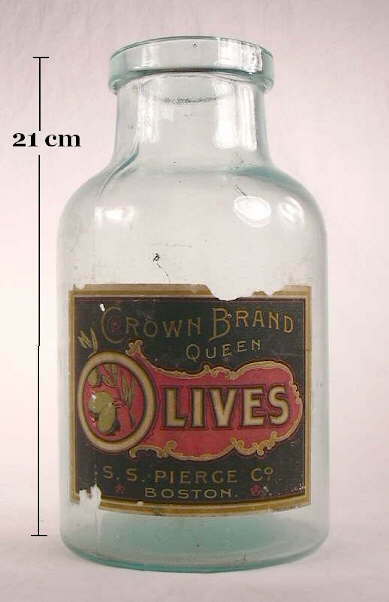 All the above information combines to indicate a likely manufacturing date range between 1913 and the mid 1920s. 12. 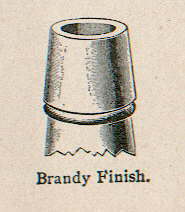 BRANDY or Wine - Also called a tapered top with ring, tapered collar with ring, collar with ring, long tapered collar with ring, broad sloping collar above a ring, tapered brandy finish, brandy with bead, whiskey finish, bitter finish (if the upper part is relatively short), and likely other names as this was a very commonly utilized finish. Click http://www.sha.org/bottle/pdffiles/IMACSfinishes.pdf to see the illustration (#12) in the IMACS table. This two-part finish is essentially an oil finish (#11) on top of a very narrow bead finish (#3). The upper portion of the finish is relatively tall - usually equal to or taller than it is wide - and flares out from top to bottom. The tall upper portion has an outside surface which is typically very flat (like the illustration to the right), though can occasionally be slightly convex or concave. The lower collar is a narrow, rounded ring. The extreme top edge of this finish can be rounded or abruptly flat like the illustration to the right, which is from the 1908 Illinois Glass Company catalog and is fairly typical for the style. 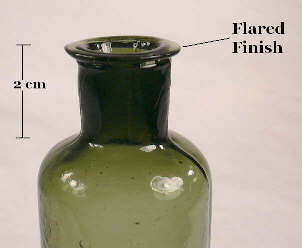 Two other common finish styles closely parallel the brandy finish : the mineral finish (#2), which differs in that the upper portion is usually shorter than the brandy finish with a lower collar that is flat (not rounded) on the outside surface, with a distinct flaring outwards (the mineral finish could actually be considered the precursor to the brandy finish); and the straight brandy finish (#25) which has no distinct taper to the upper finish portion, but shares the rounded lower collar. All three finishes (brandy, mineral, and straight brandy) merge and gradate into each other making it difficult at times to discretely classify a finish to one specific type or the other. 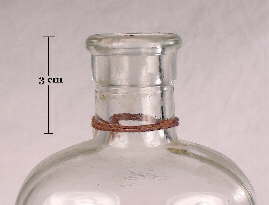 The brandy finish is a common style on many types of bottles manufactured between the 1860s and the 1920s, when external threaded finishes began to dominate bottle closures. 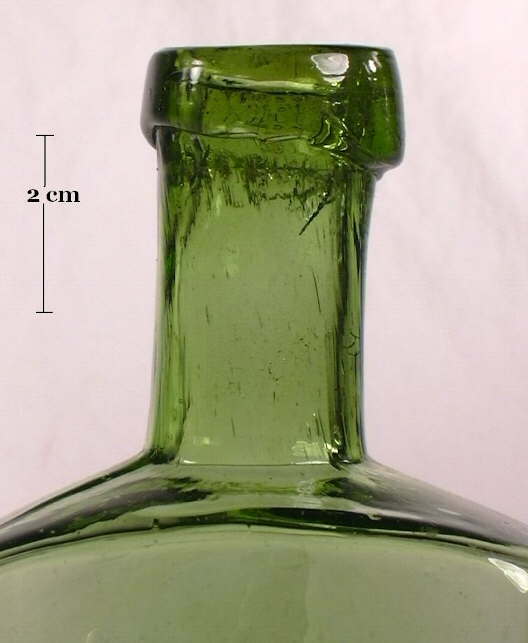 This finish is very common on all shapes and sizes of liquor bottles and flasks, many types of medicinal bottles (particularly larger sizes), and occasionally other types of bottle. 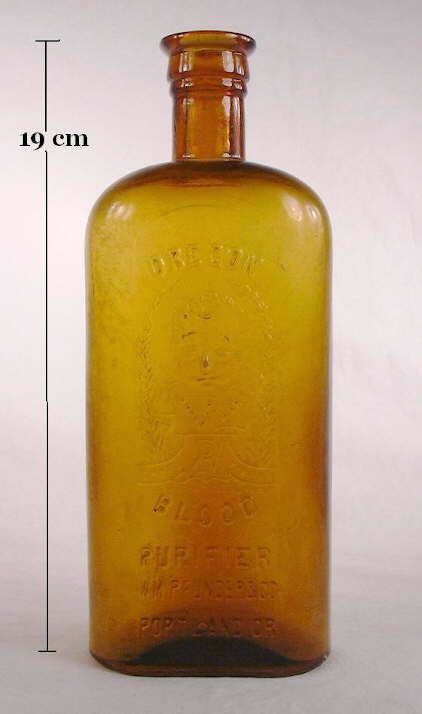 Like the oil finish, the brandy finish rarely if ever seen on ink or perfume/cologne bottles, wide mouth food bottles, beer bottles, and druggist and drugstore bottles. The brandy finish can be found on applied, tooled, and machine-made bottles. 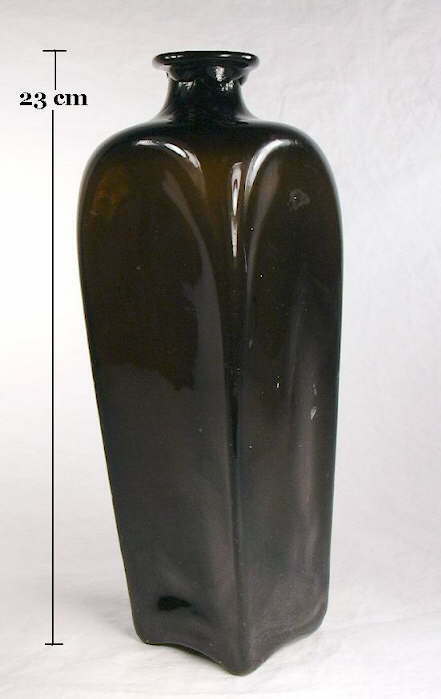 The applied brandy finish pictured above left (amber bottle) is on a Hildebrandt, Posner & Co. (San Francisco, CA.) 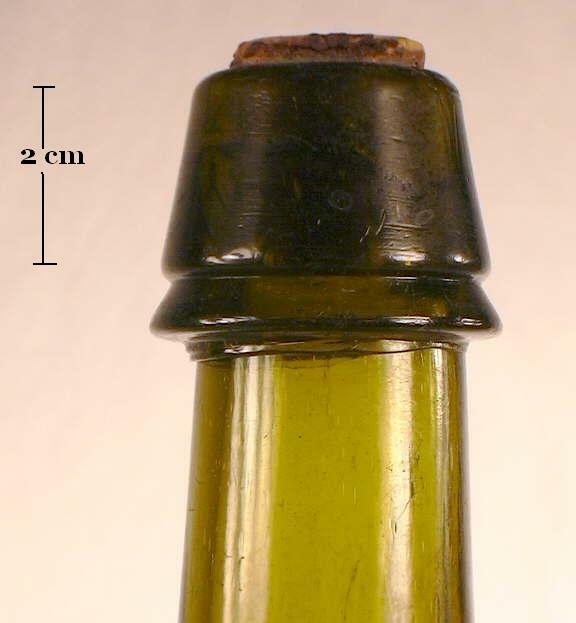 whiskey bottle that dates from 1884 to 1890 (Thomas 2002). 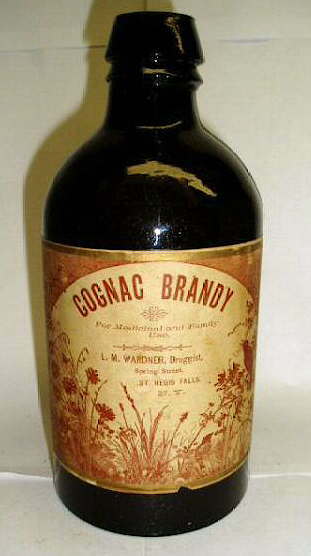 The brandy and straight brandy finishes are by far the most common type of finishes on cylinder whiskey and other liquor bottles during the era noted above. Both can even still be occasionally found today on more expensive scotch and other liquor bottles utilize corks for sealing. 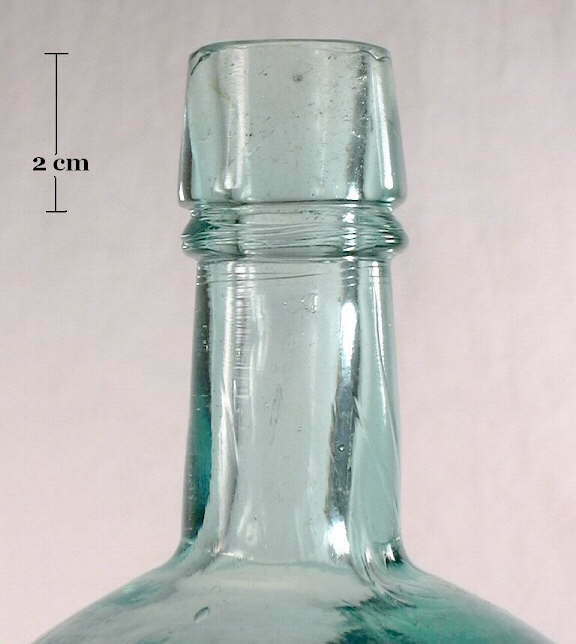 The tooled brandy finish to the immediate right (aqua bottle) is on a Dr. Hoofland's German Tonic (Philadelphia, PA) and dates from the early 1880s based on diagnostic manufacturing features (Blasi 1974). 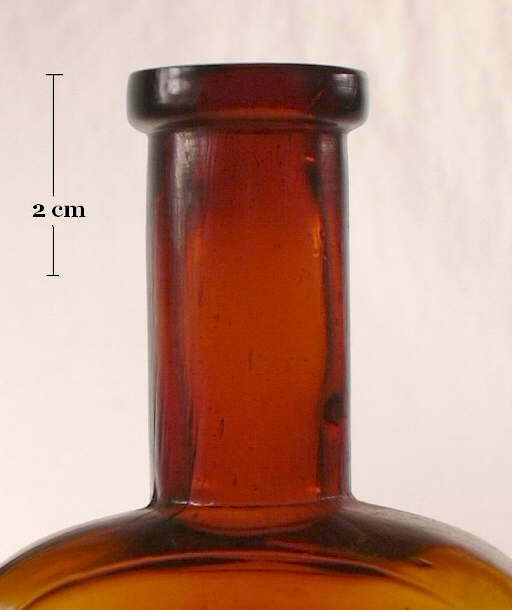 This is a very common finish on larger sized (i.e., 7-8"+ or 18-20 cm+) patent medicine bottles made during the era noted above. 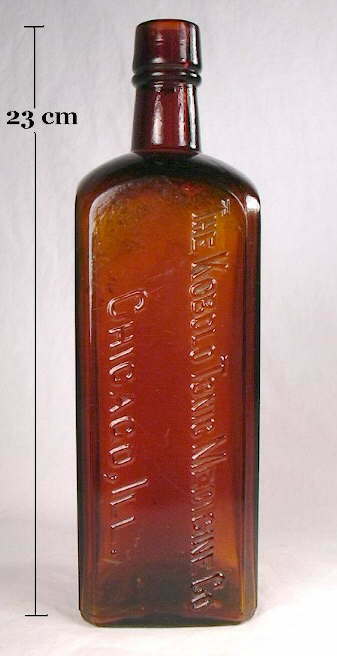 The machine-made brandy finish to the above right (amber bottle) is on a Kobolo Tonic Medicine Co. (Chicago, IL.) 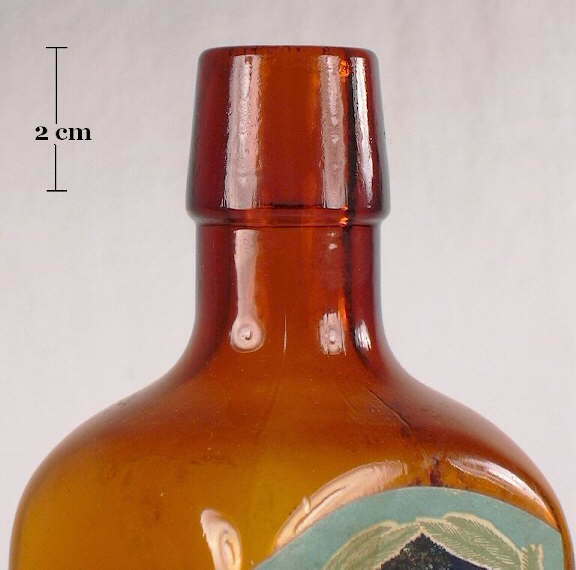 bottle that dates from the 1910s to possibly very early 1920s. 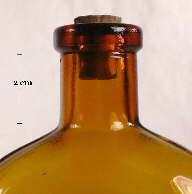 This is an example of a brandy finish that could almost equally be called a straight brandy finish (#25) as there is only a very slight taper outwards from top to bottom. It should be noted that this conformation of brandy finish was also called the "bitter finish" by some glass companies when the upper part was relative short (even shorter than the pictured bottle) compared to to usual brandy finish which has a proportionally taller upper part (Fairmount Glass Co. 1910). 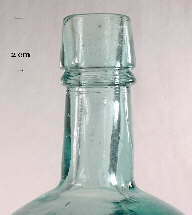 The pictured bottle is an example of a medicine bottle that was made towards the end of the era of popularity for this popular finish. 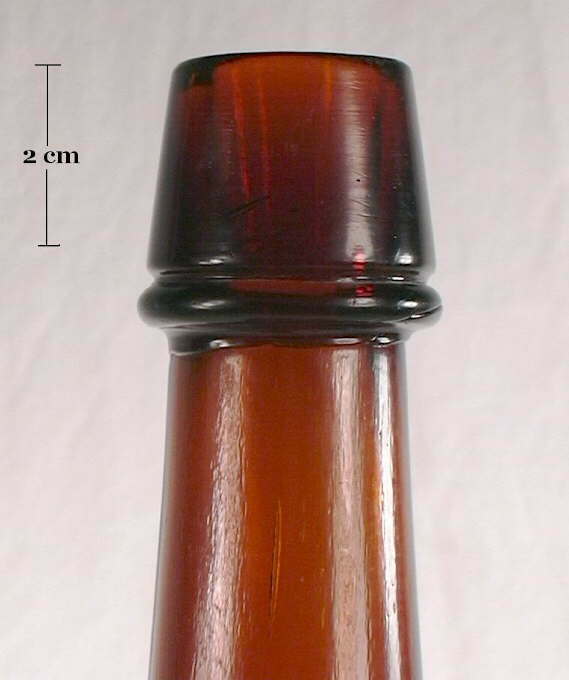 This finish was largely replaced by the small mouth external thread finish (#16) during the 1920s and 1930s on most bottles types, with the exception of liquor bottles which can still sometimes be found with this finish (some types of imported single-malt scotch as an example). 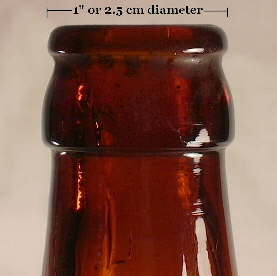 In general, this finish is not very common on machine-made bottles, but does occur with enough frequency to warrant mentioning. 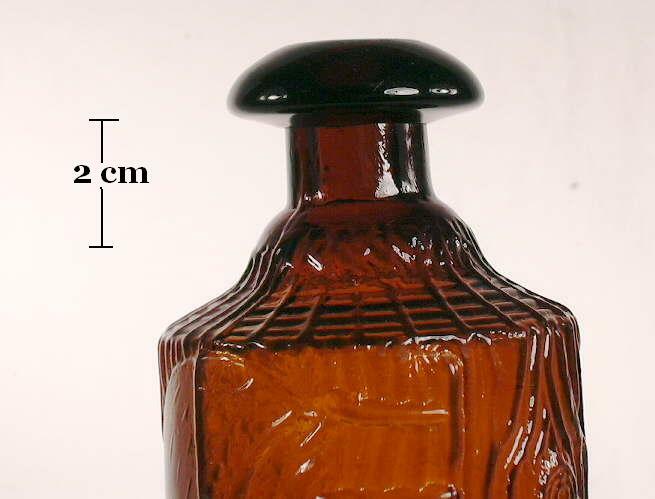 The tooled brandy finish to the left (colorless bottle) is on a pint sized liquor flask embossed L. EPPINGER / PORTLAND (Oregon) inside of a plate (i.e., produced in a plate mold), which dates between 1882-1887 (Thomas 1974). Brandy finishes are very common on most styles of liquor flasks made between the late 1870s and National Prohibition which went into effect via the Volstead Act on January 16th, 1920. Click here to move to the second page of Part II: Types or Styles of Finishes. Return to the Main Bottle Finishes & Closures page.